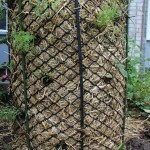 It has been almost a month, since I have planted seedlings into my permaculture towers, following the garden preparations and the building of the towers. 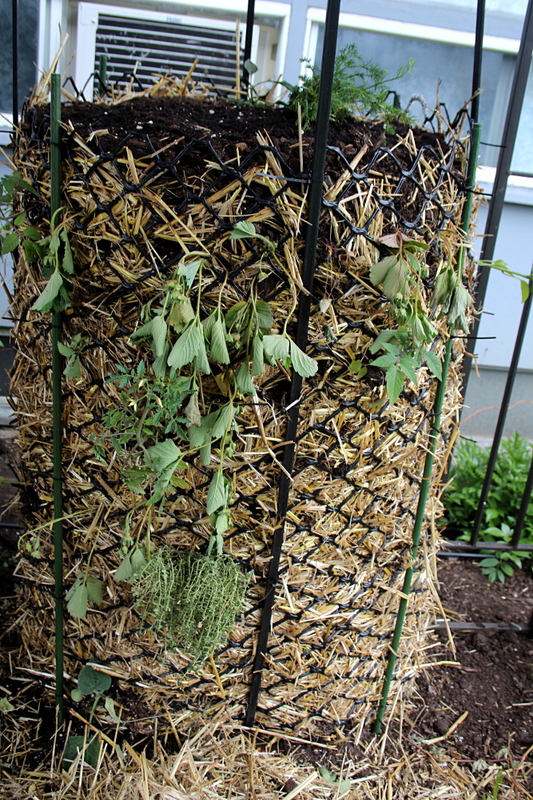 Each day I marvel at the strong green plants sprouting out of the towers. 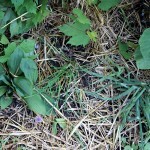 Some are already blooming, a few small green tomatoes have formed, and with each rain things get greener and wilder. 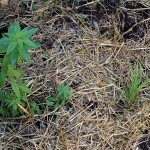 Here is a progress update on the plants, with photos on May 27th (day 1), June 10th (day 14), and June 20th (day 24). 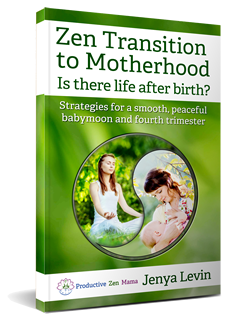 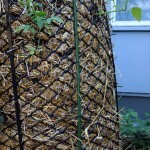 You can click on the thumbnails to see more detailed, larger photos. 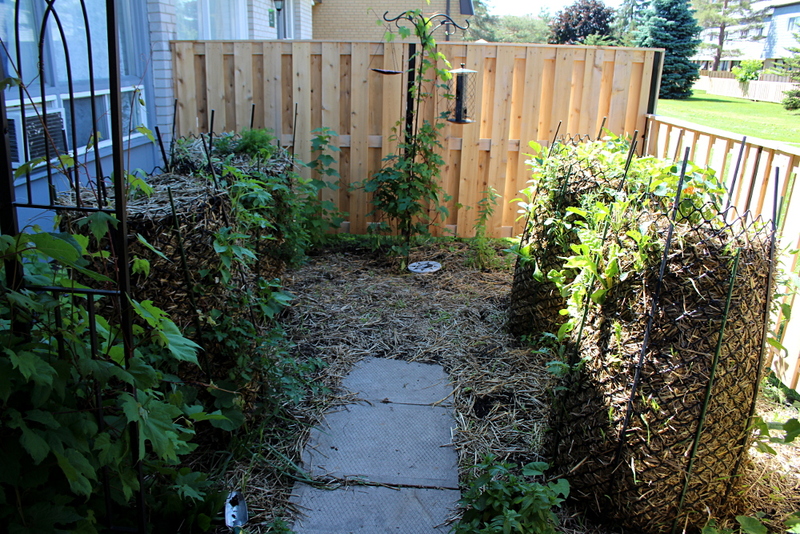 Due to the fence that is now in place, it is a bit hard to take photos of the sunny side of Towers 3 and 4. 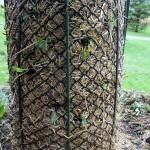 Thus it is not easy to display progress clearly. 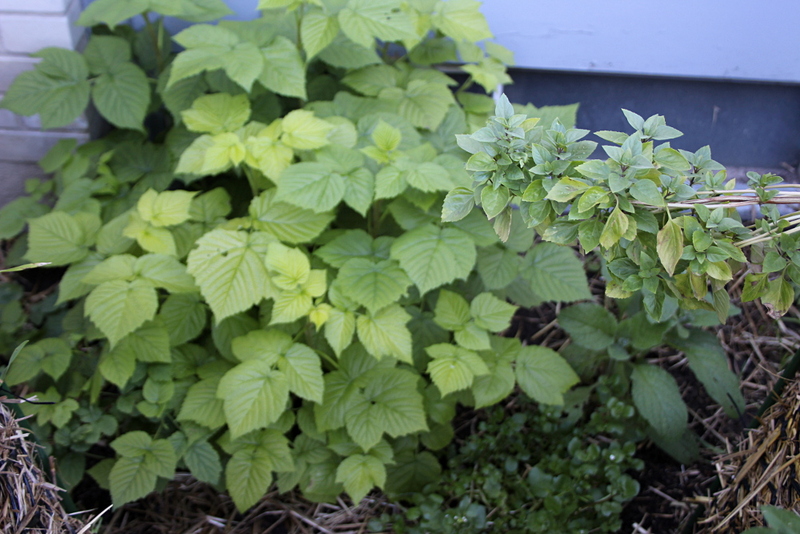 I also have to really try to find the time of day when the sun is not too bright: lately the sky has been cloudless, and so it has been hard to get clear pictures that are not overexposed. 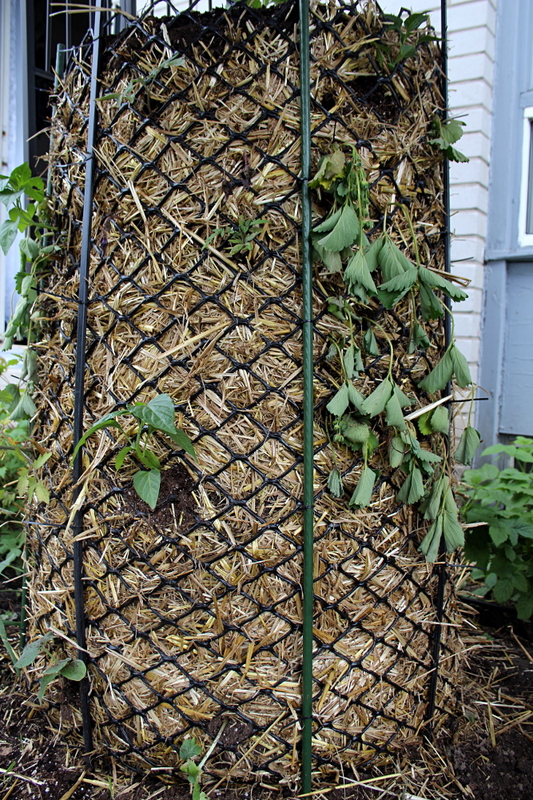 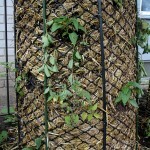 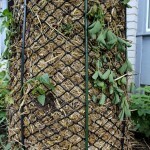 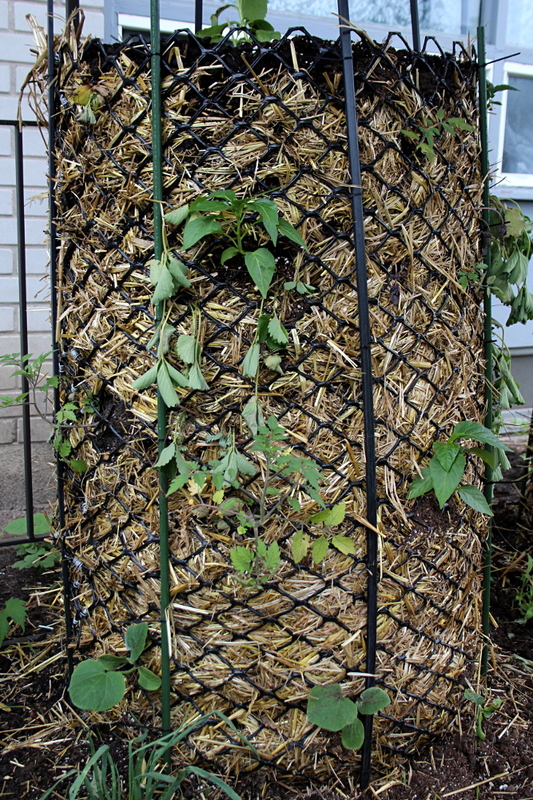 I have planted sweet peas, snow peas, and scarlet runner beans around Towers 3 and 4, on June 1st, and some scarlet runner beans on a small patch by the West fence, on June 11th. 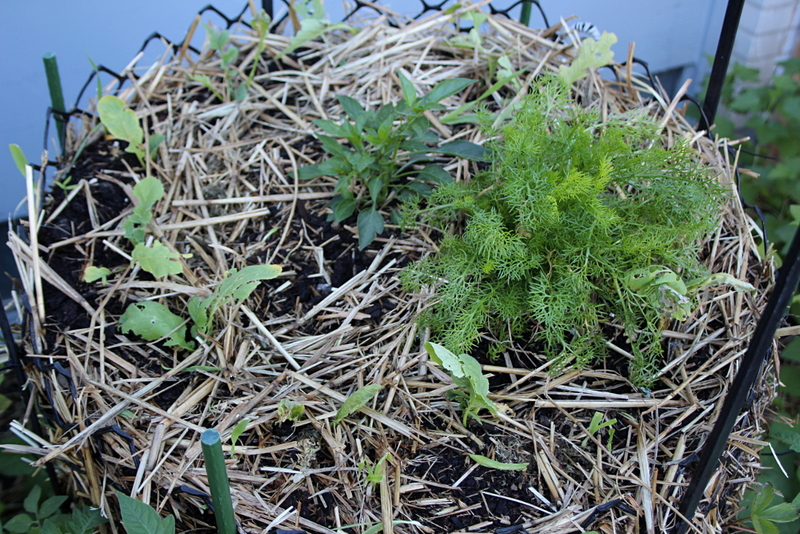 I have also thinned the radishes on top of Tower 1, on June 15th, and replanted those I pulled out into the top of Tower 2, around the hot peppers and chamomile. 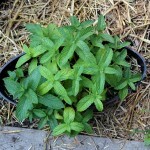 Stevia on top of Tower 1. 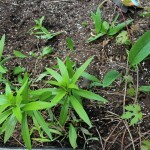 The plant is generally happy and is sprouting new leaves. 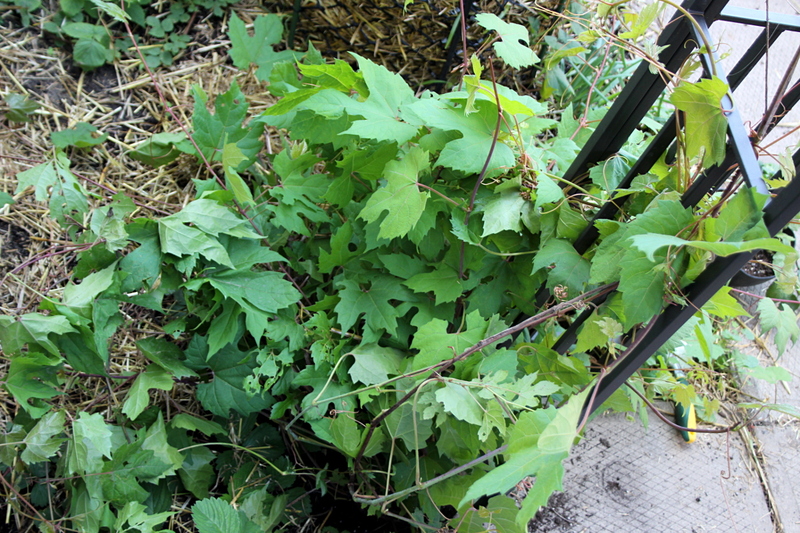 However, some time in the second week, someone (I suspect, a clumsy squirrel) broke the top of the plant off. 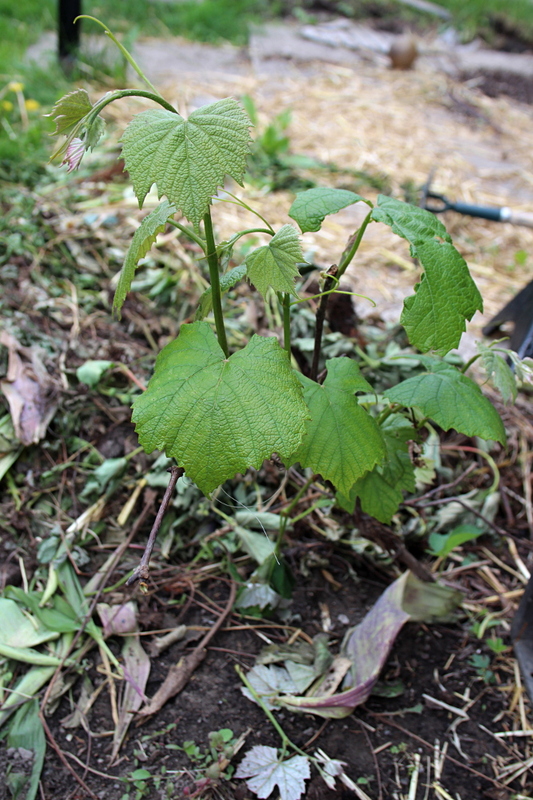 I have collected the leaves and used them in salads. 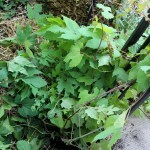 The plant seems to be recovering well. 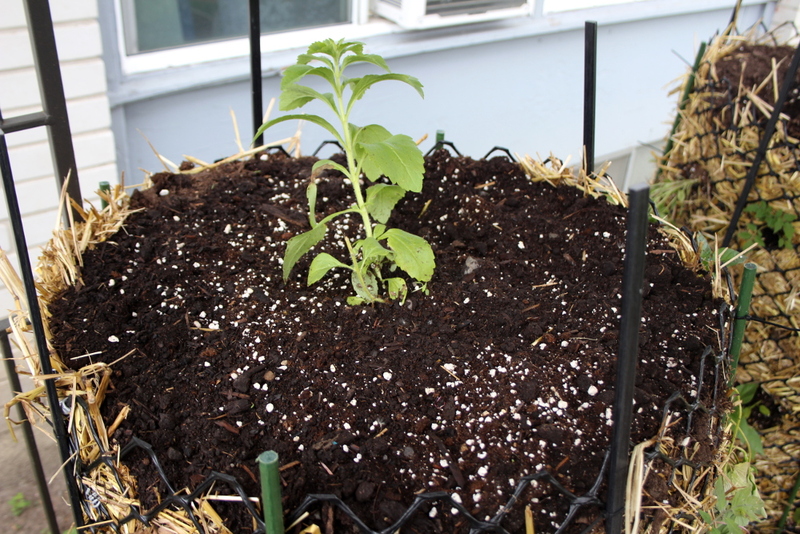 Yellow cherry Gold Nugget tomato and butternut squash in one section, and in another –Alba Regie sweet pepper among strawberries, another Yellow cherry Gold Nugget tomato and another butternut squash. 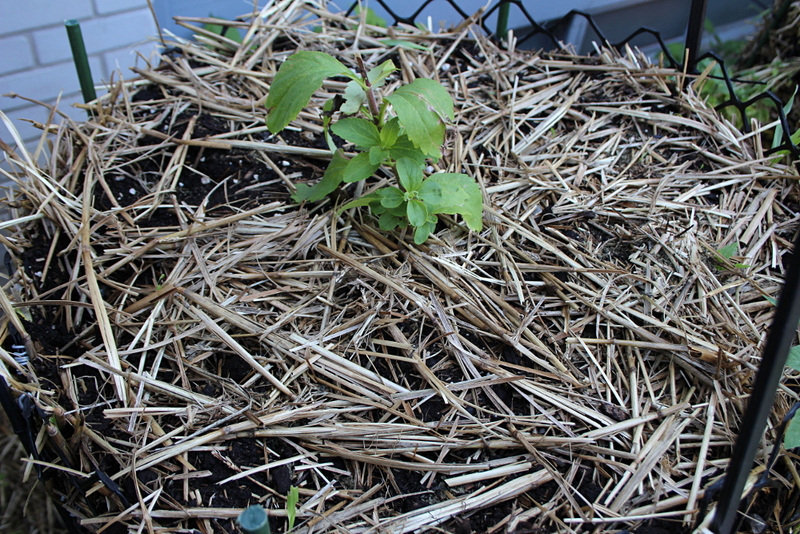 Very few strawberries have survived being transplanted, so I have pulled those out to allow more space for the living plants. 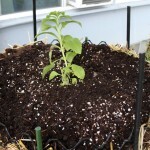 The tomatoes, peppers, and squashes seem to be happy and growing well. 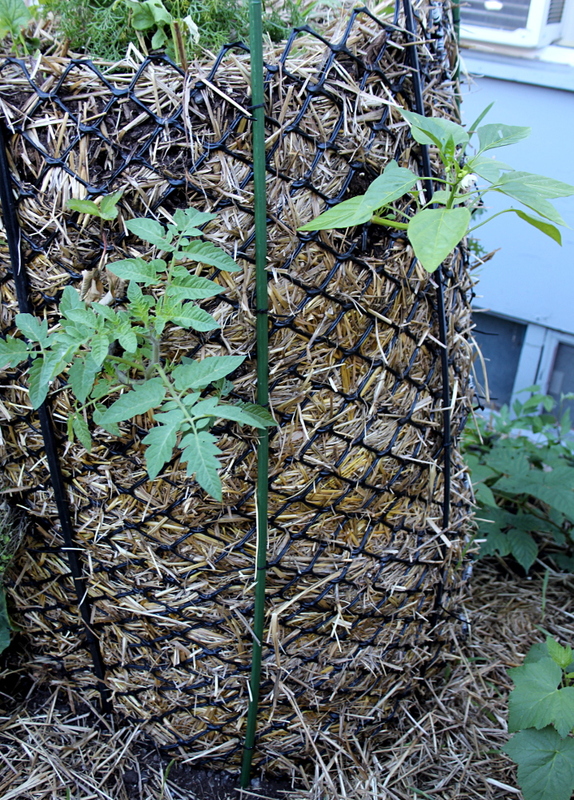 Beefsteak tomatoes, half-dead purple basil, Alba Regie pepper and spaghetti squash in one section, Lipstick sweet pepper and strawberries in the next. 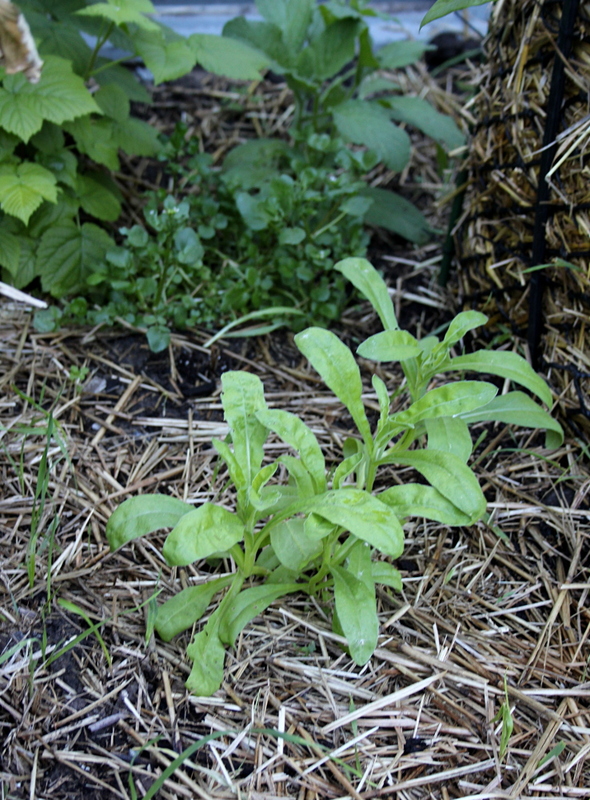 As expected, the purple basil did not survive, as it was dying even before transplantation. 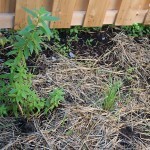 The tomatoes, peppers, and squash are doing well. 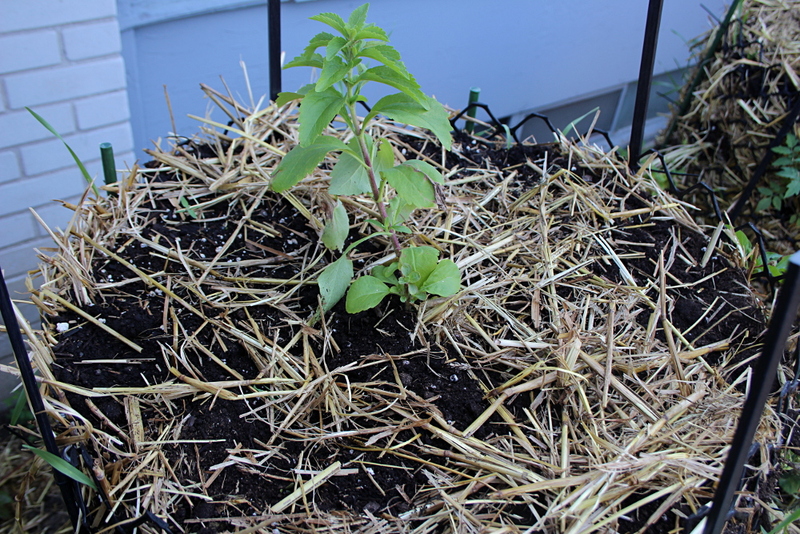 Thai hot pepper and German chamomile plants on top of Tower 2. 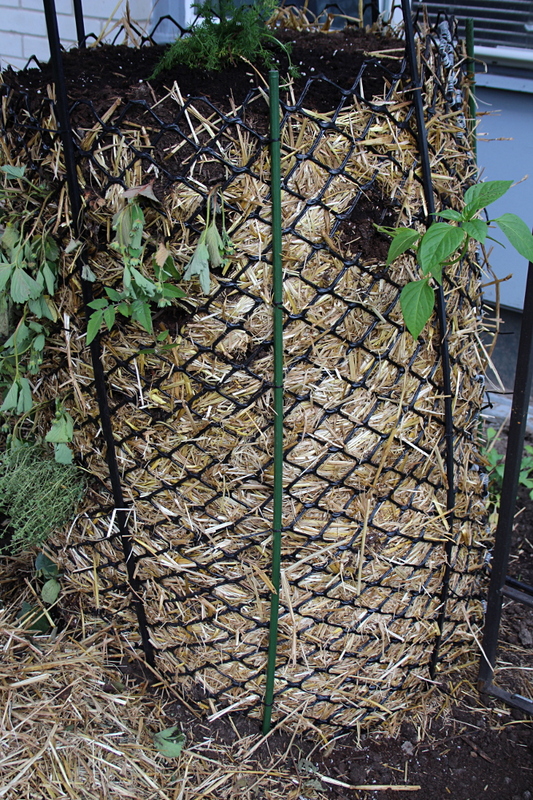 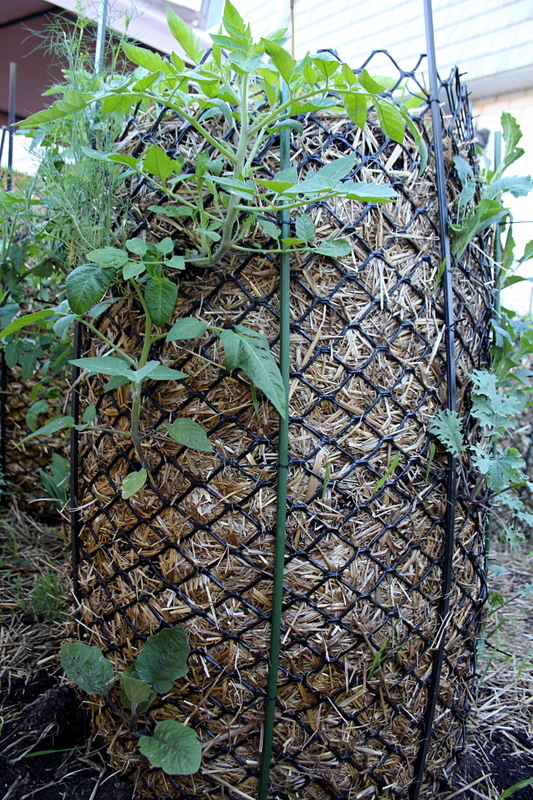 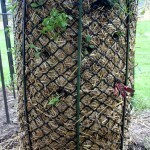 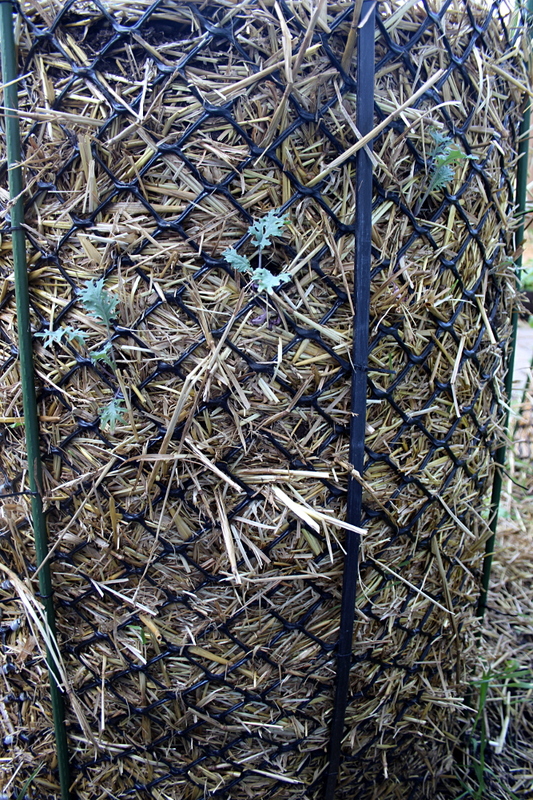 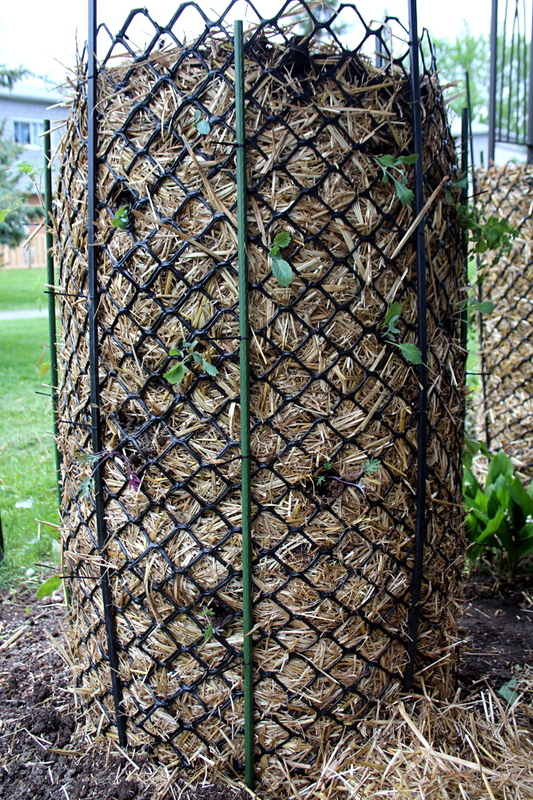 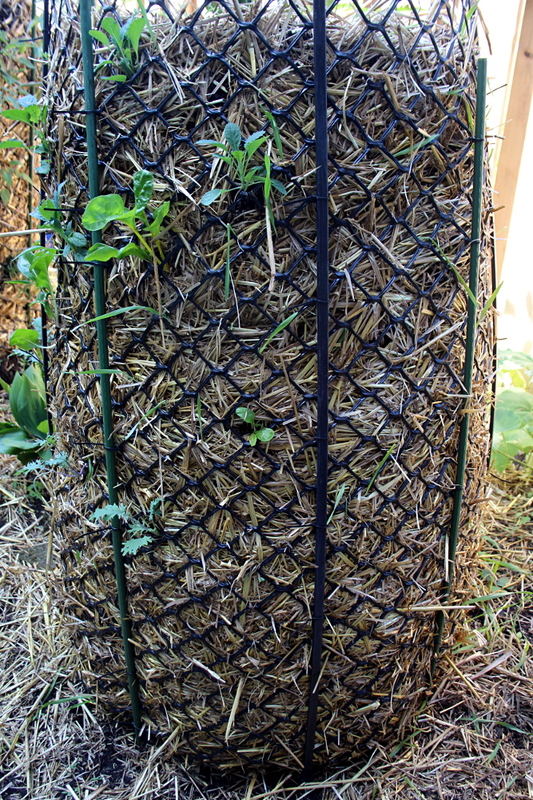 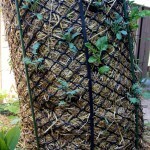 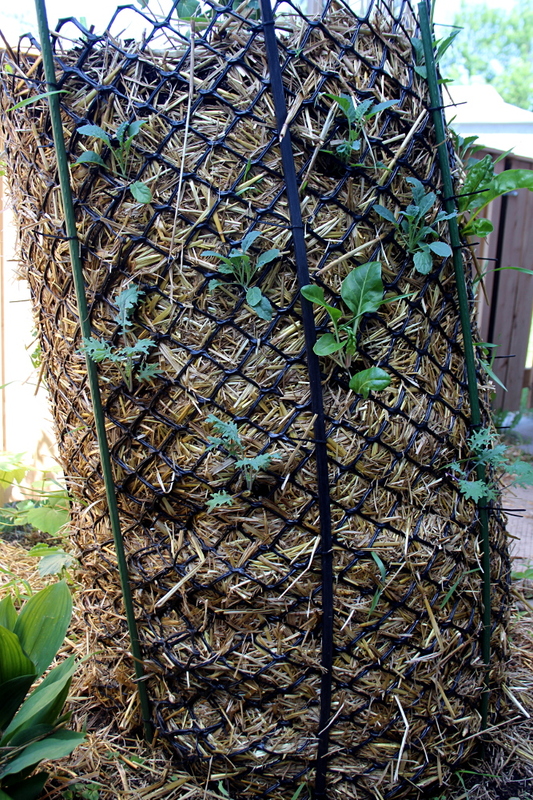 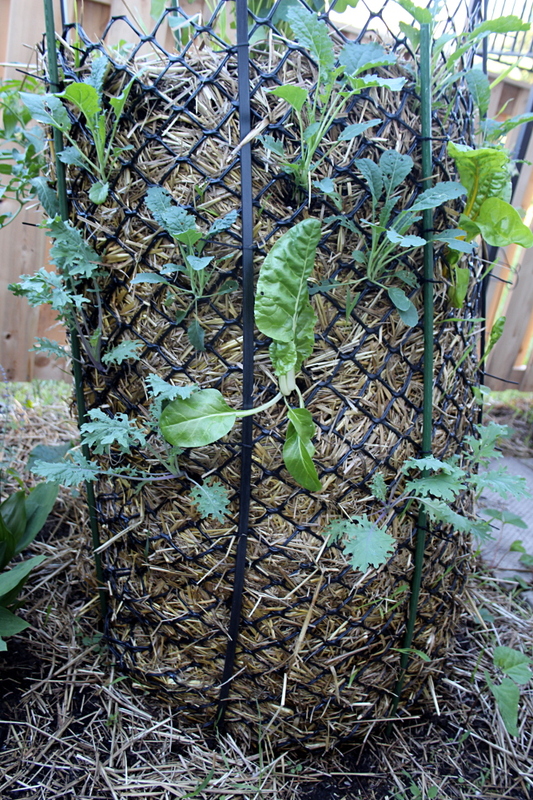 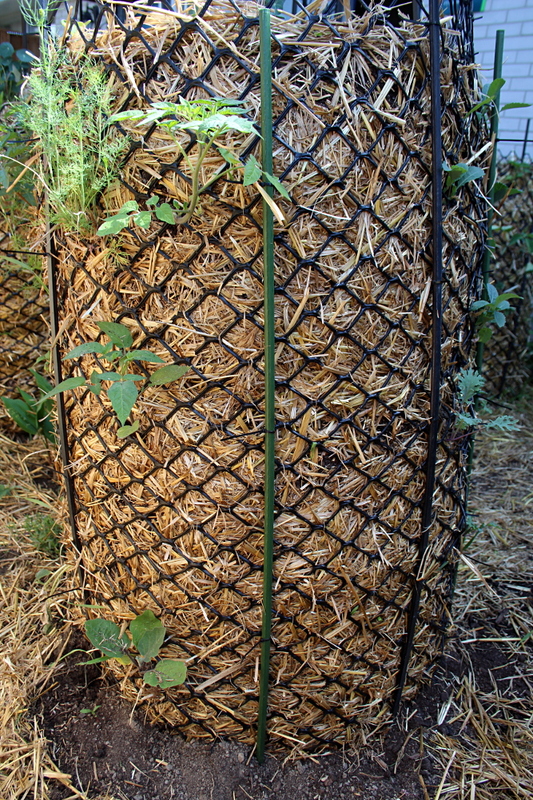 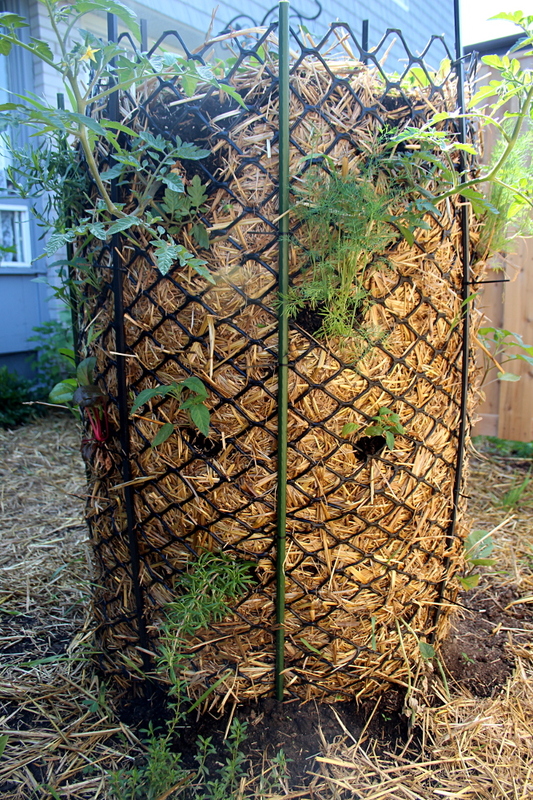 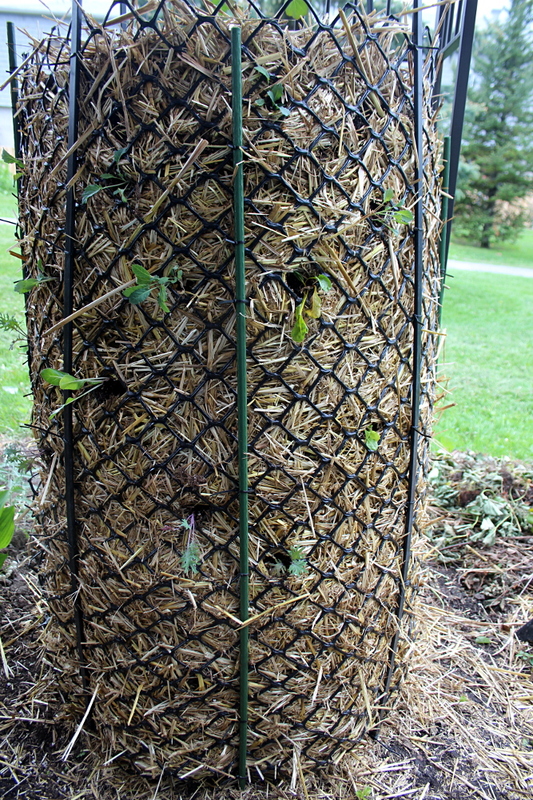 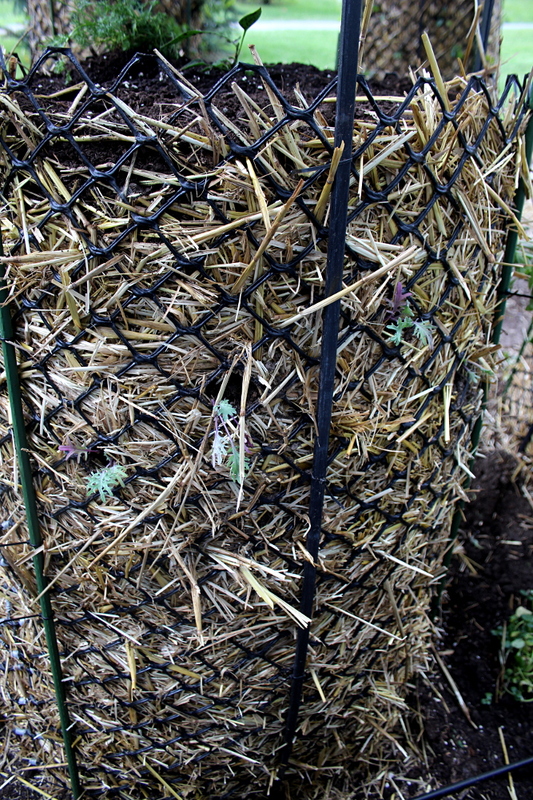 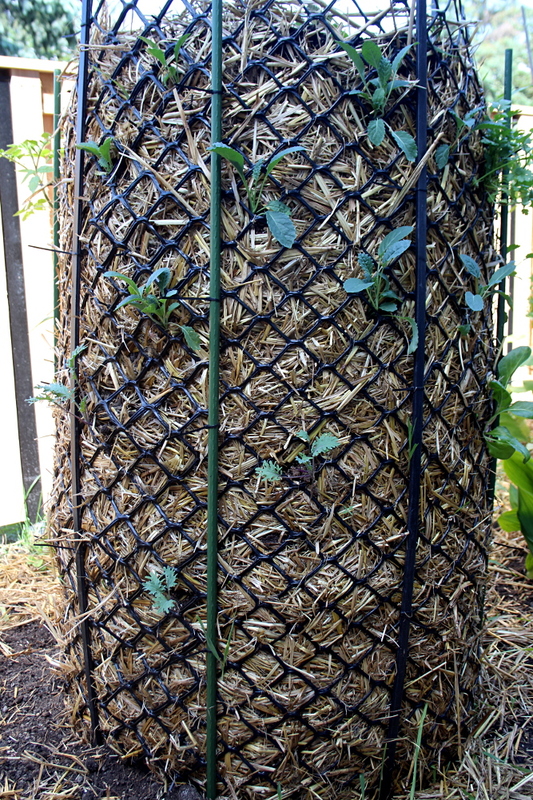 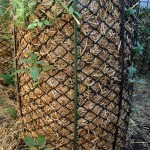 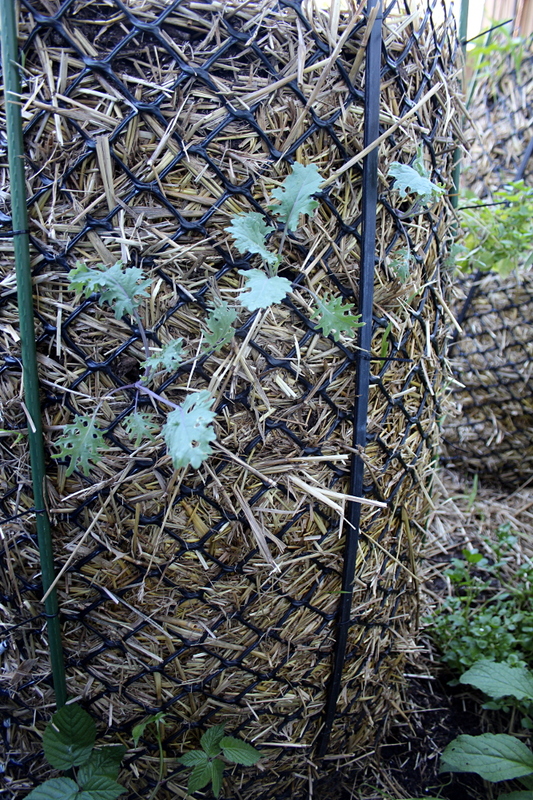 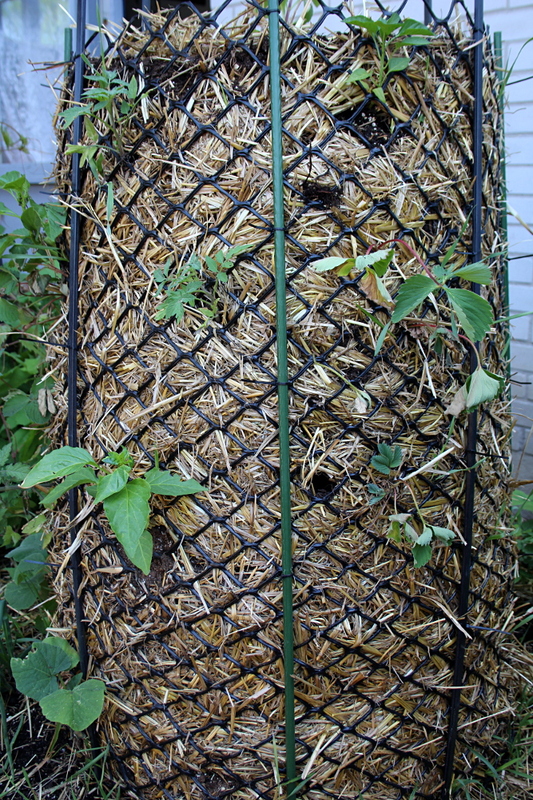 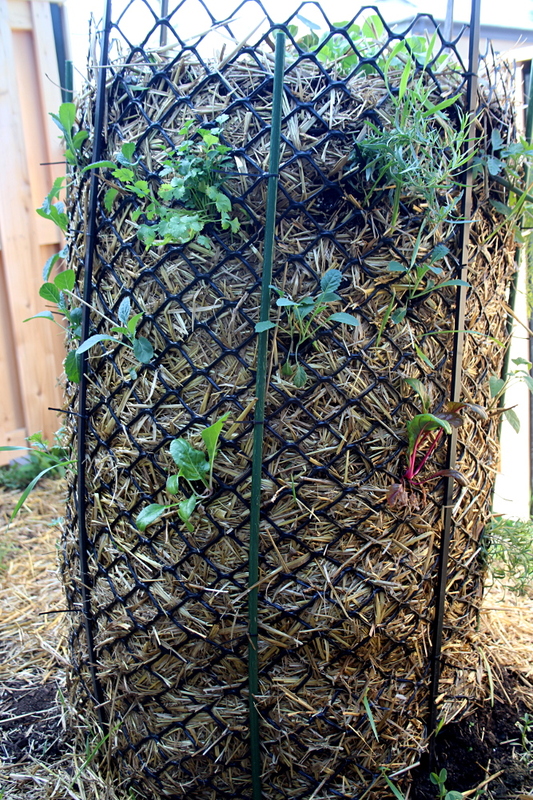 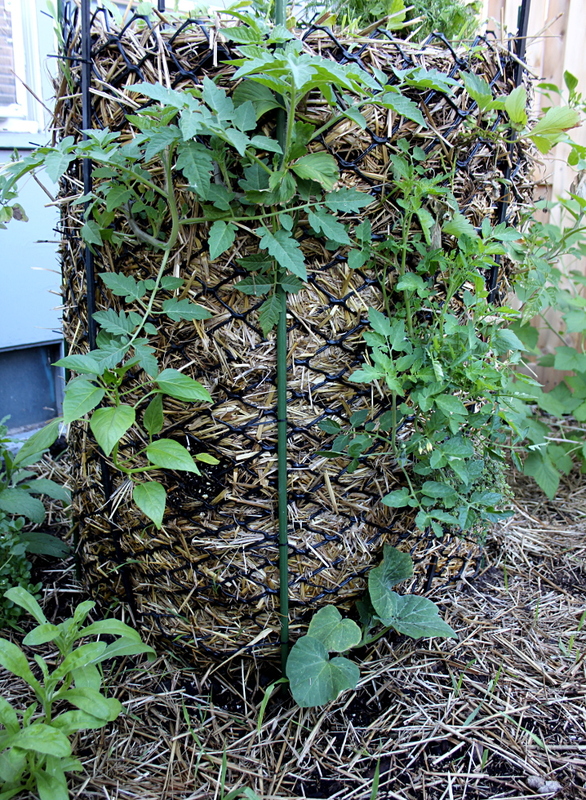 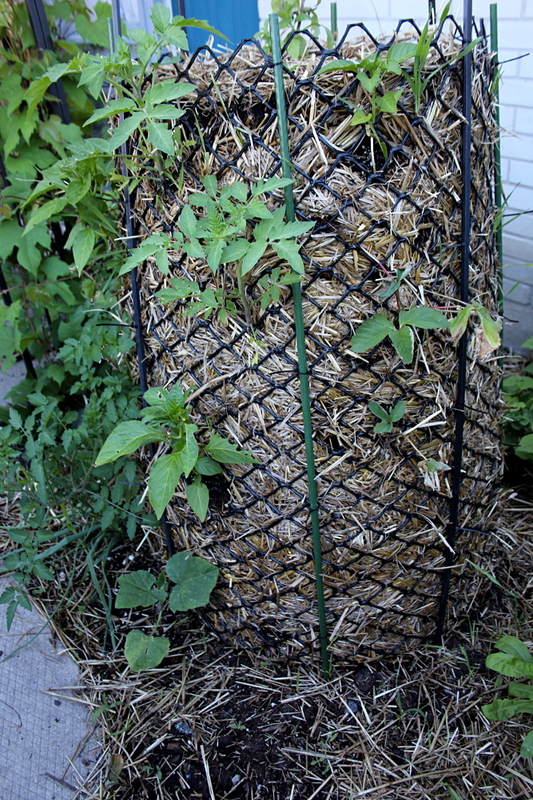 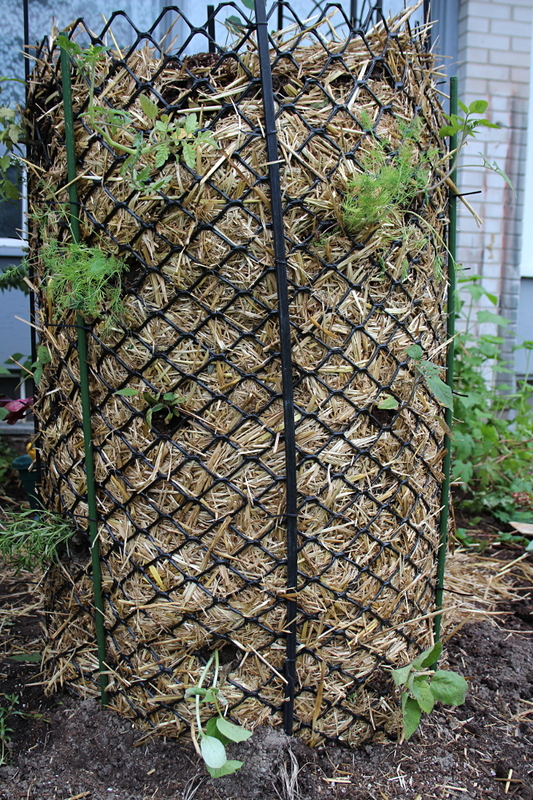 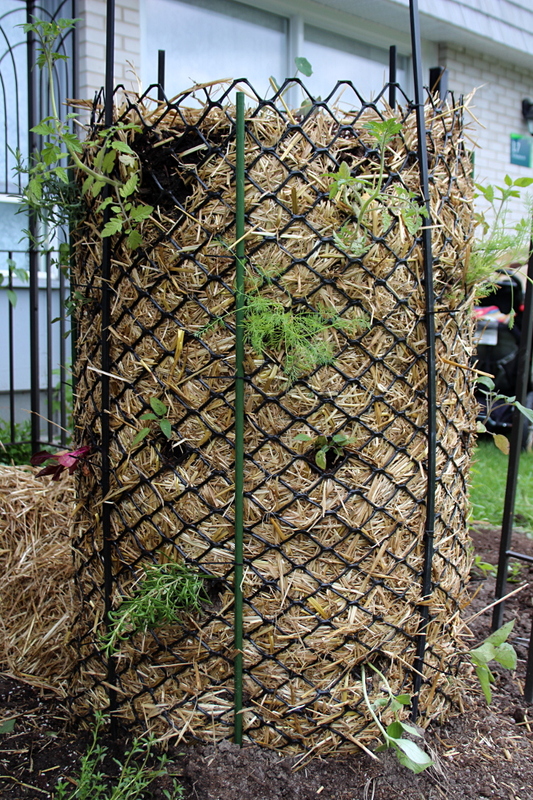 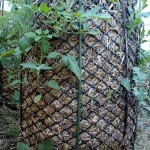 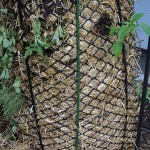 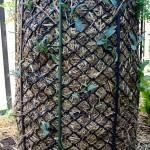 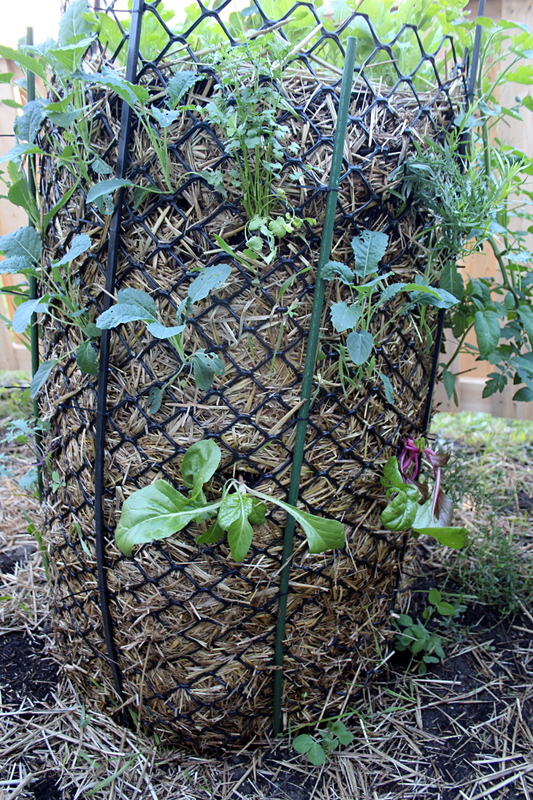 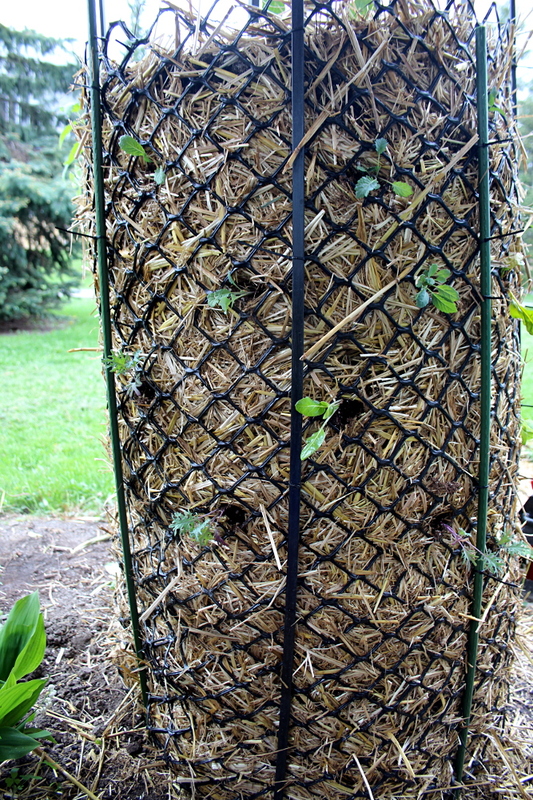 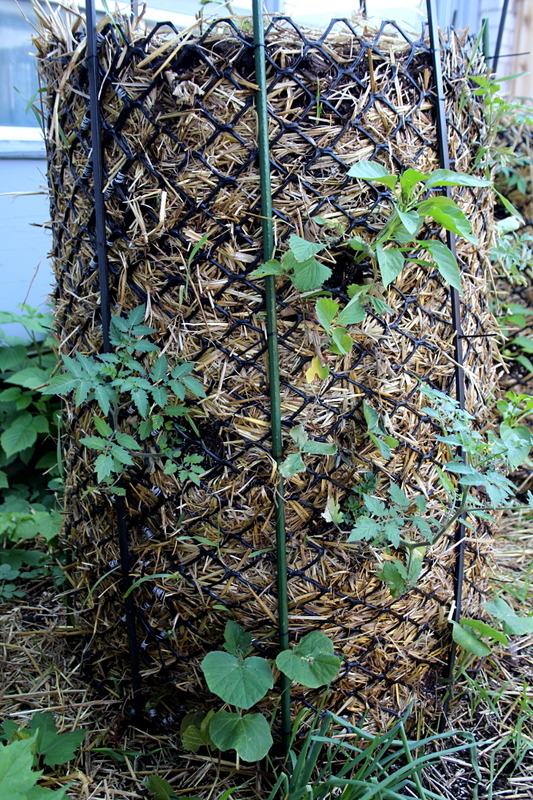 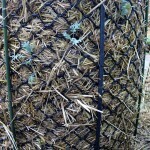 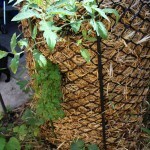 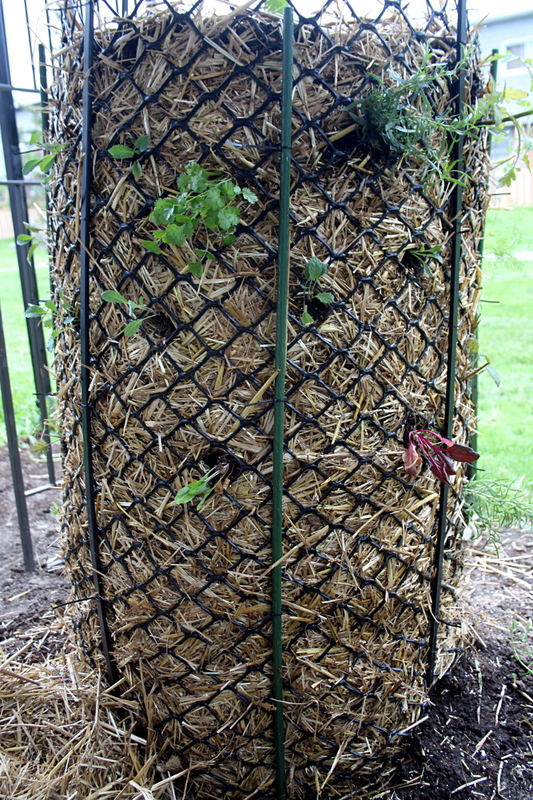 I have covered the top with straw to hold in the moisture and prevent extensive soil movement during watering. 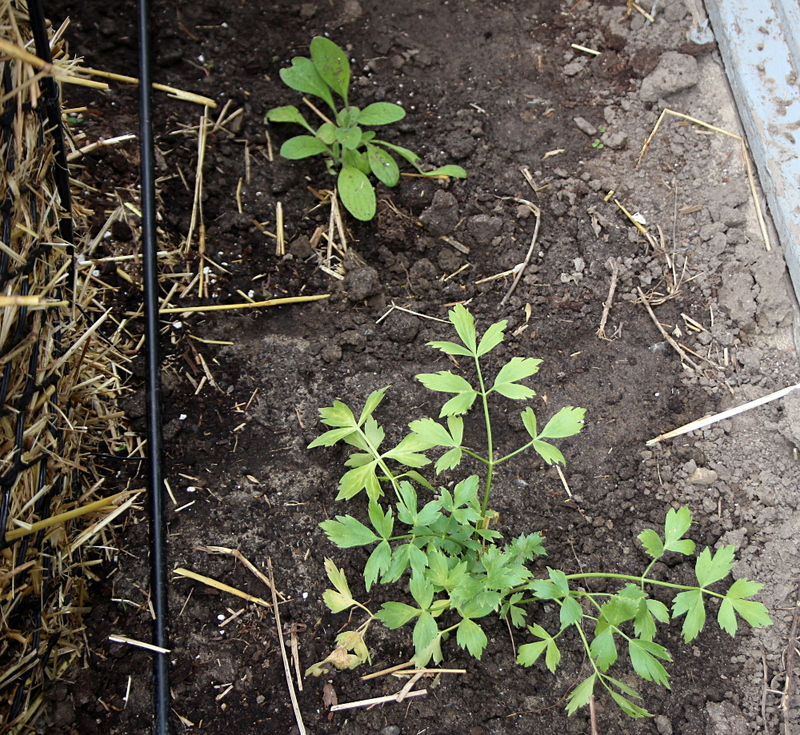 I have also transplanted radishes which I have thinned out of Tower 4. 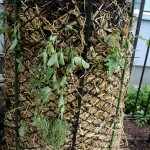 They did not like it much, so I’m not sure how many will survive. 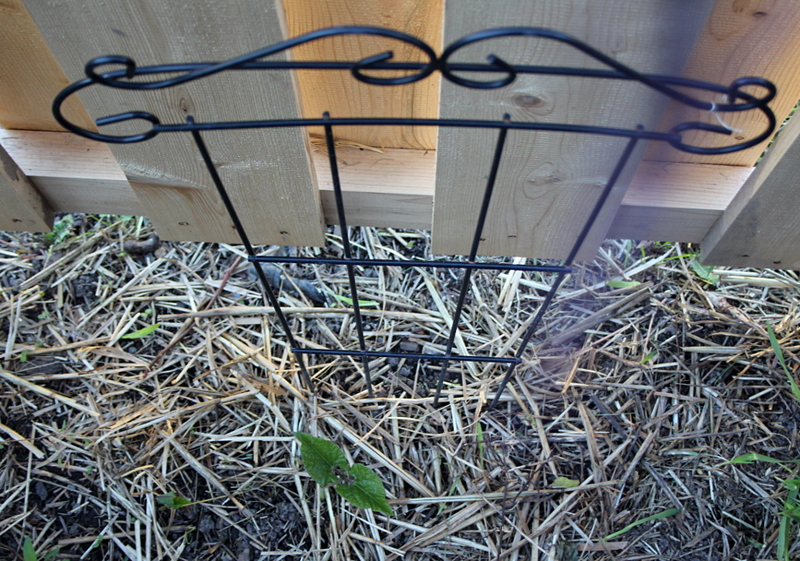 It was that or throw them out, though, so I figured I’d give them a chance. 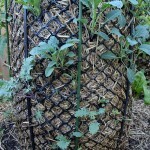 Next time, I might make seed tape instead of planting directly into the ground. 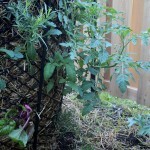 Columnar basil in one section, two Fox cherry tomatoes and a Romanian sweet pepper in the next. 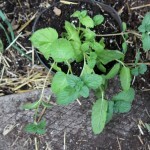 As opposed to the purple basil, the columnar basil seems to have taken to its spot well, and is putting out new leaves. 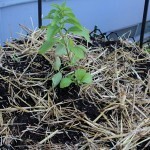 The tomatoes and peppers are growing quite happily. 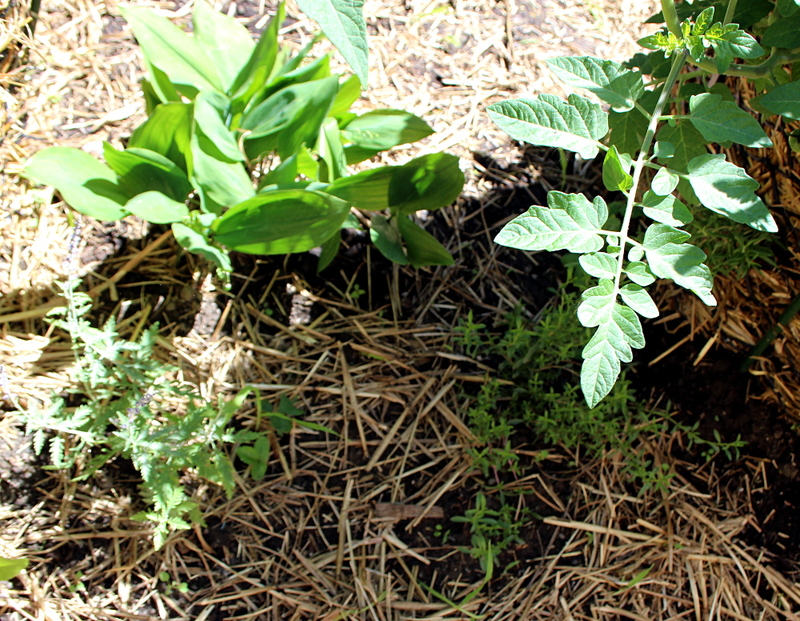 Droopy strawberries, Matt’s Wild tomato in their midst, and lemon thyme underneath, with a butternut squash at the bottom in one section, and more strawberries and another Matt’s Wild tomato in the next section. 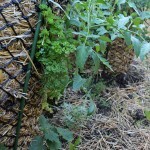 Tomatoes have grown so much already that they are overshadowing lemon thyme. 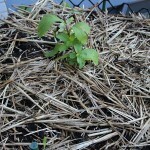 I shall keep an eye on it – it might need to be transplanted to get enough light. 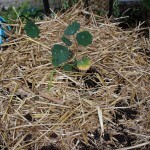 Most of the strawberries have died in this section as well, so I cleared them away. 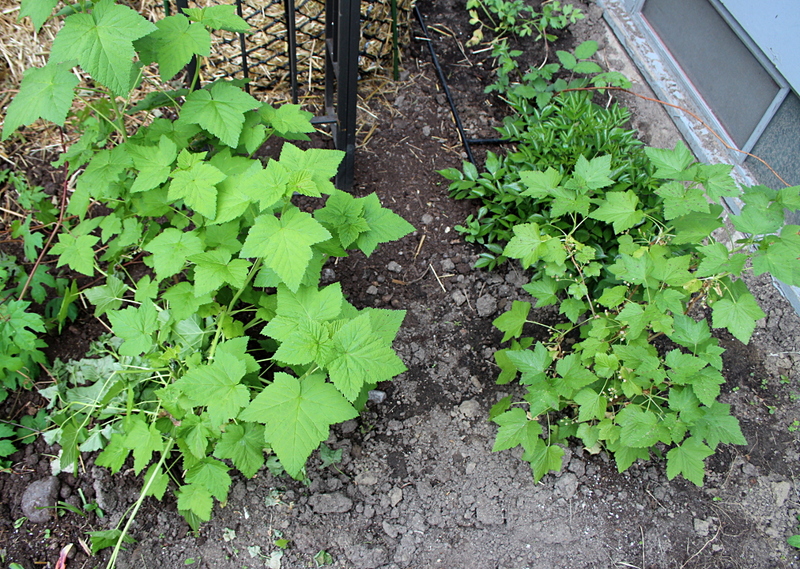 The squash seems to be doing well, and the tomatoes are blooming and already putting out fruit. 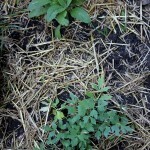 Closeup of strawberries and another Matt’s Wild tomato in the second section from the photo before, and a single Romanian sweet pepper in the next section. 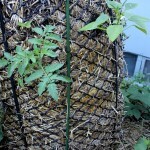 Strawberries removed, the tomato is growing a bit slower here, but seems to be strong. 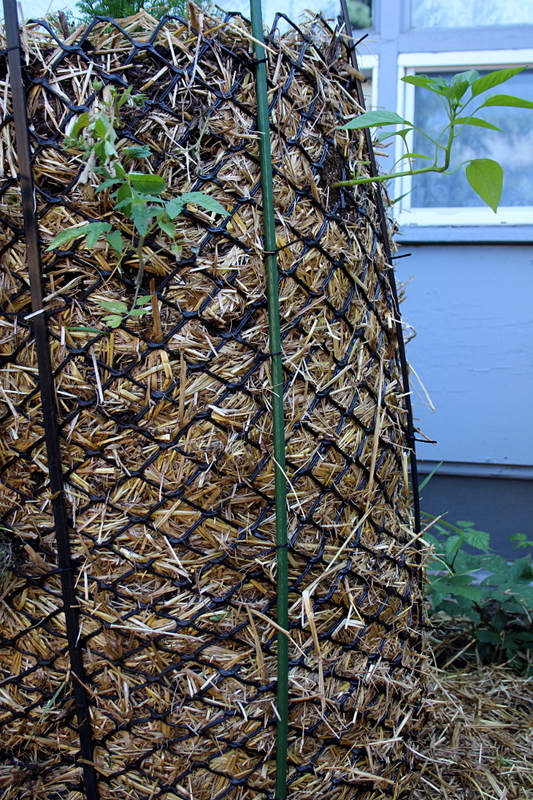 The pepper plant is blooming. 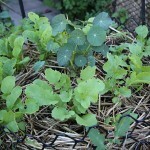 Two oakleaf kale seedlings in one section, and two more in the next one. 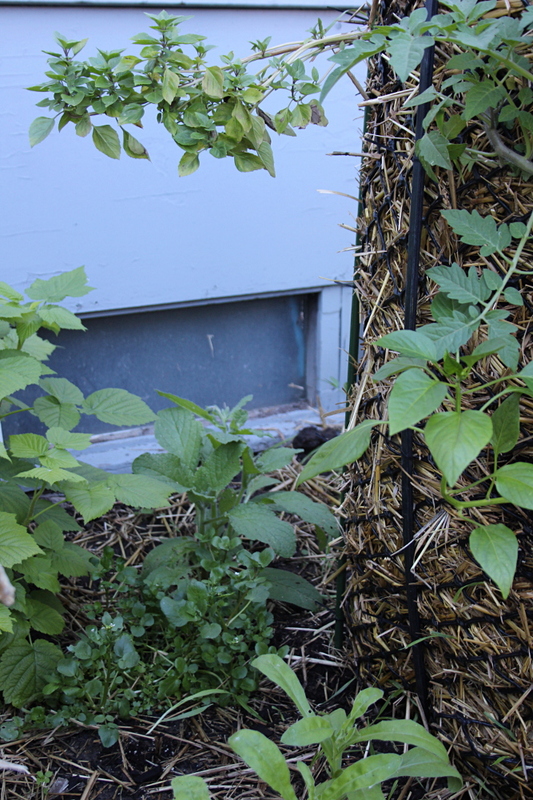 Slowly but surely the kale is growing, although someone seems to find it tasty. 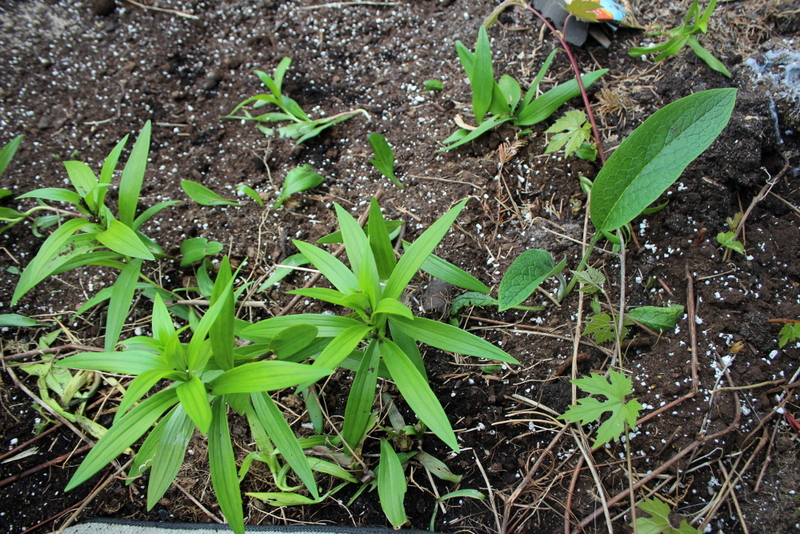 I have put crushed egg shells around some of the plants to deter snails, but so far I’m unsure whether it’s the snails that are causing the damage. 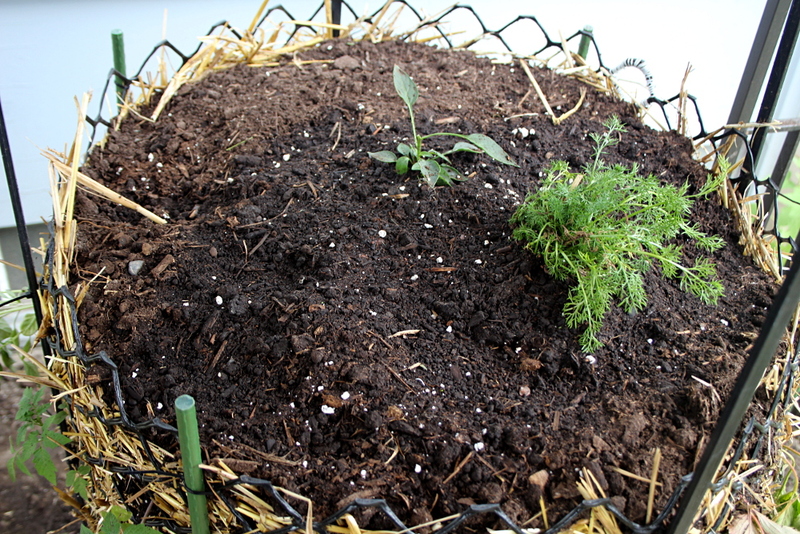 Nasturtirum – Empress of India – on top of Tower 3, surrounded by carrot seeds. 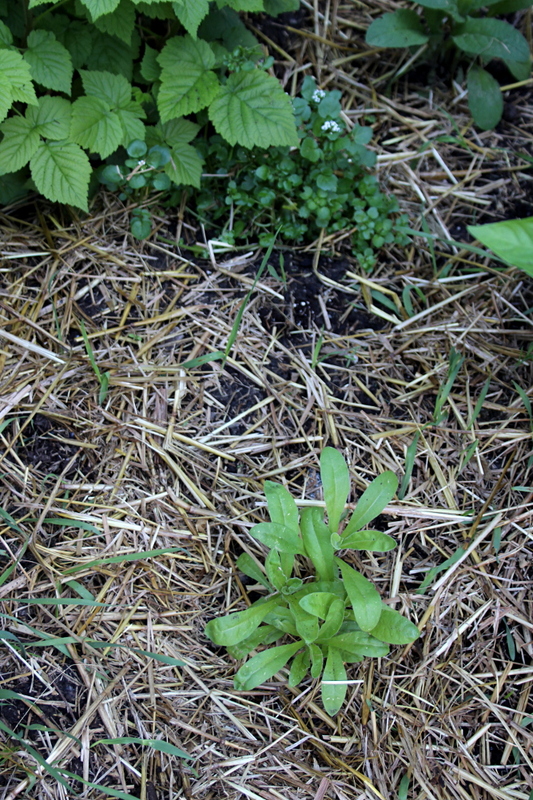 Very few carrot seeds have sprouted – I’m not sure whether my neighbours of the squirrel persuasion have had a paw in that. 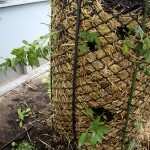 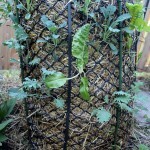 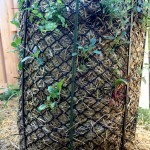 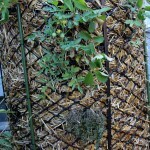 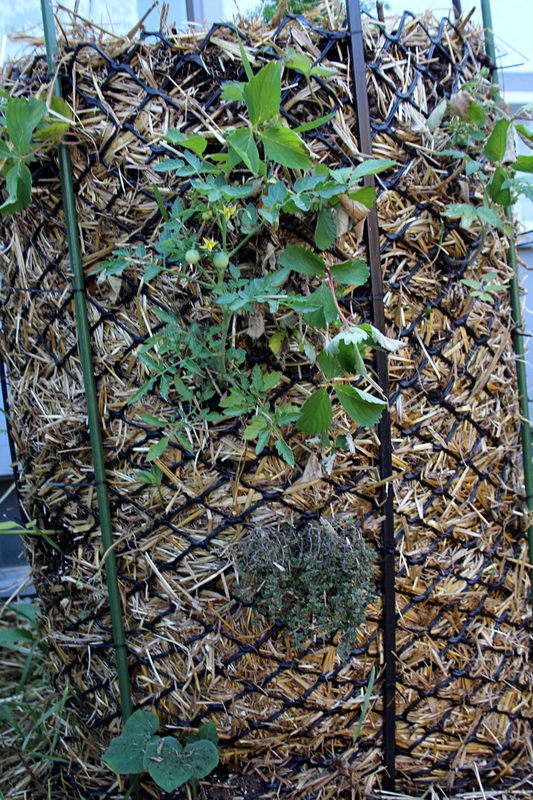 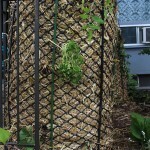 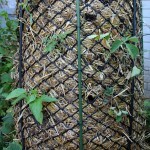 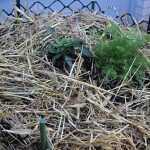 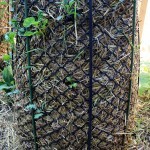 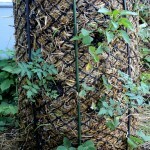 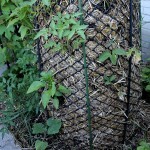 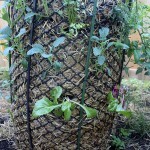 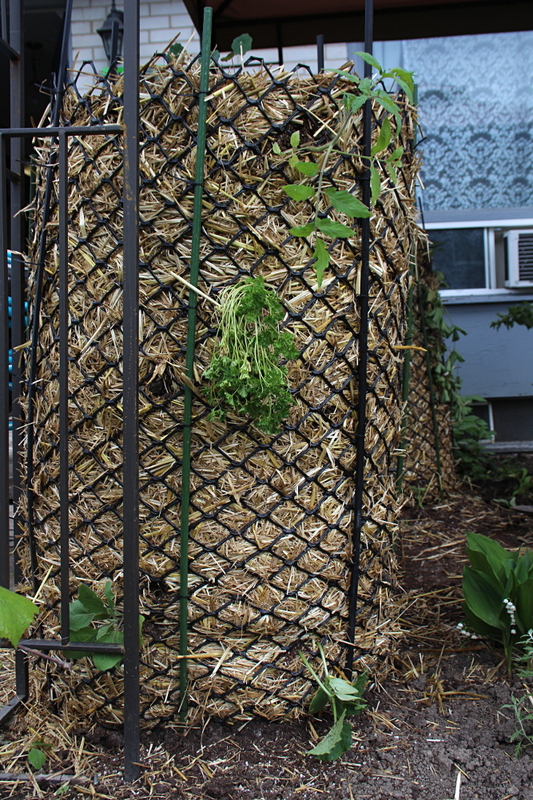 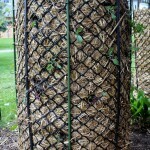 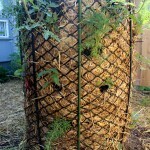 I had to remove quite a few weeds from around the towers, as the organic straw sprouted, encouraged by all the watering. 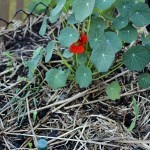 The nasturtium is growing rapidly and has put out two flowers so far. 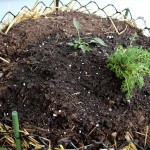 The few carrot sprouts are growing slowly. 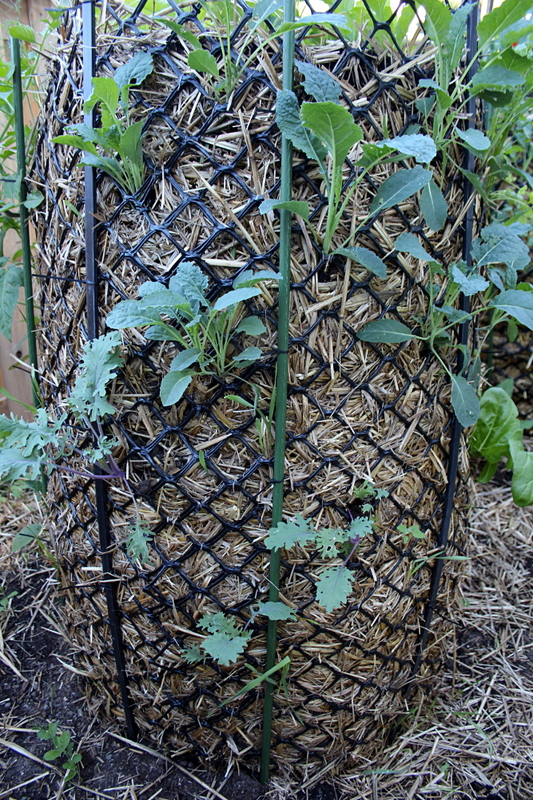 Japanese eggplant at the bottom of one section, and in the next one – Bellstar red tomato, parsley, and at the bottom Spacemaster cucumber. 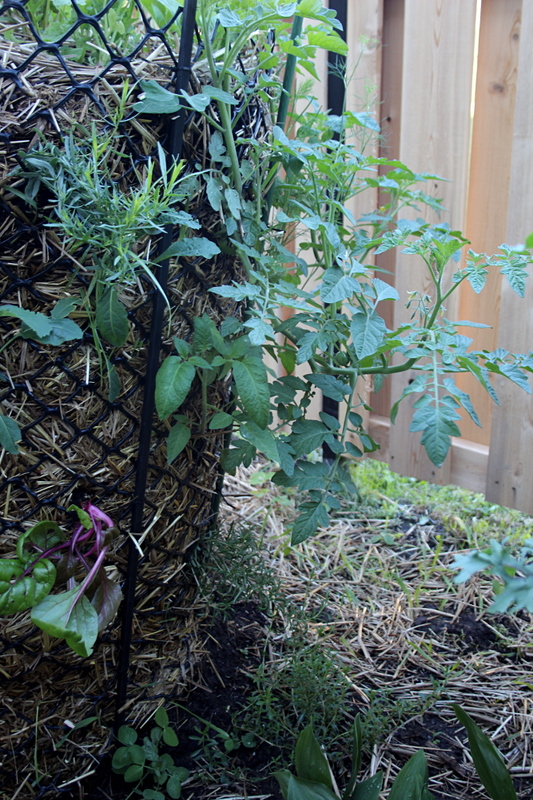 All the plants seem to be quite happy. 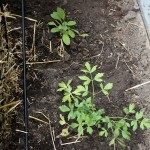 I have already used parsley in salads quite a few times, and the tomato is growing fast. 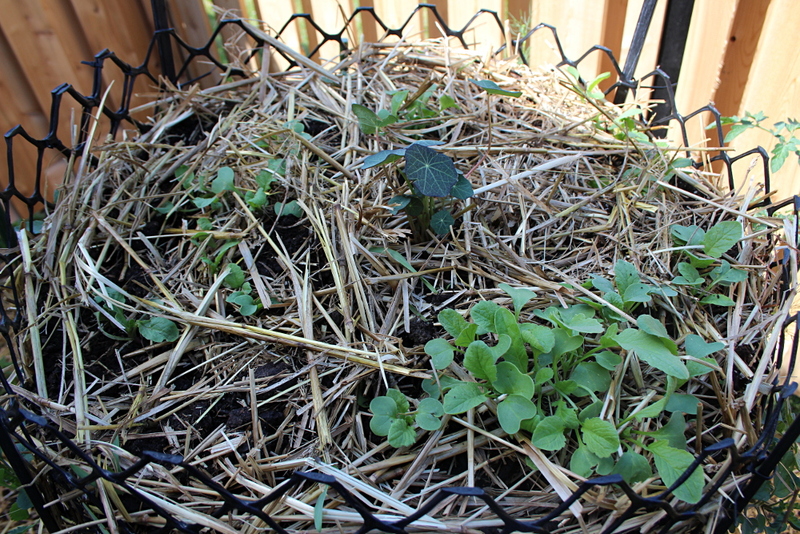 Two green kale and two oakleaf kale seedlings in one section, two green kale, one Swiss chard, and one oakleaf kale seedling in the next one. 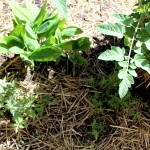 The greens seem to be happy in the semi-shade provided by the towers. 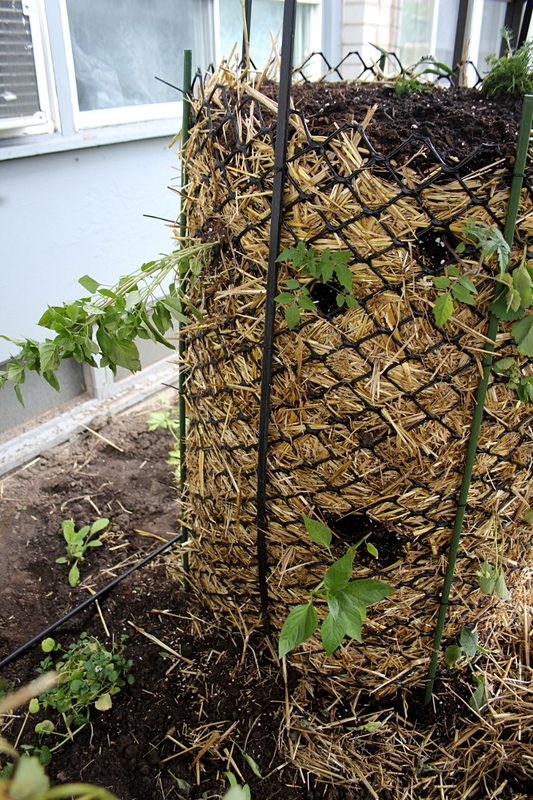 We water daily unless it rains. 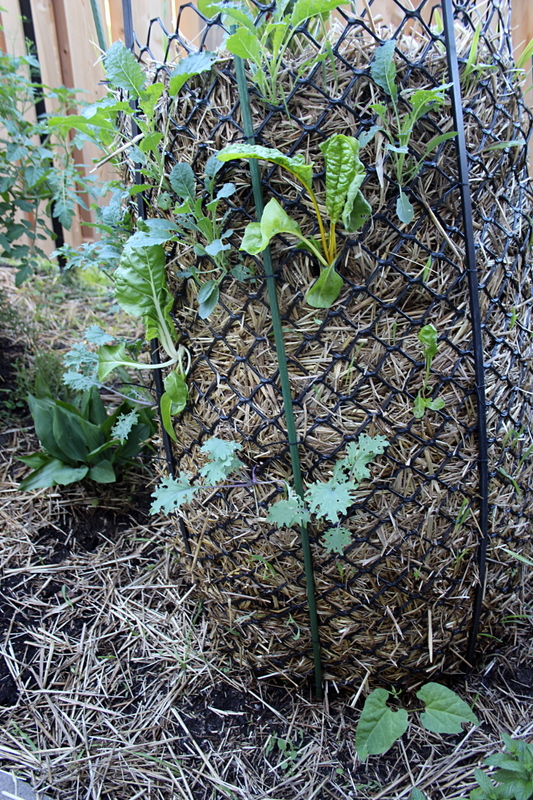 Another shot of two green kale, one Swiss chard and one oakleaf kale plant from the previous photo, and two more green kale, two Swiss chard, and one oakleaf kale seedling in the next section. 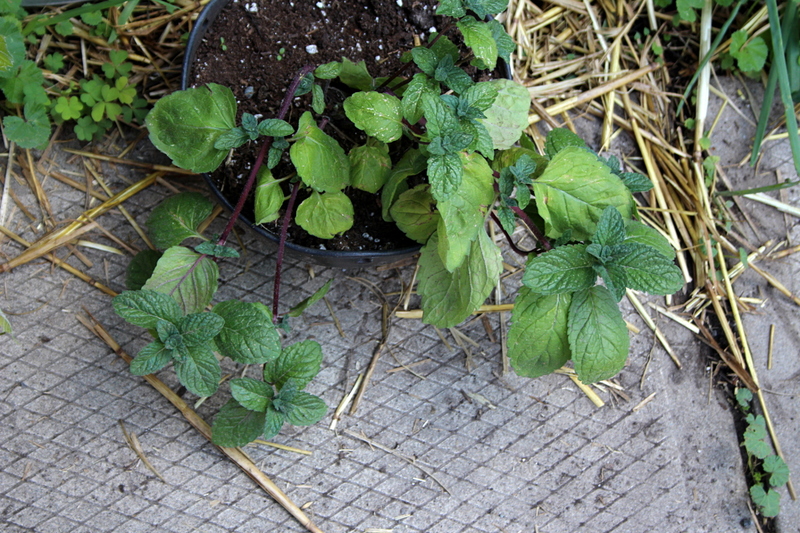 All of the greens seem to be growing steadily. 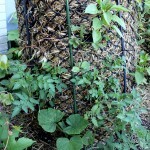 Along the bottom, between Tower 3 and the grape vine, I have planted scarlet runner beans, on June 1st. 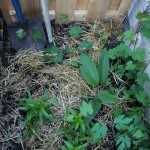 So far (day 20), two plants have sprung up so far – one with two leaves is visible at the very bottom of the photo. 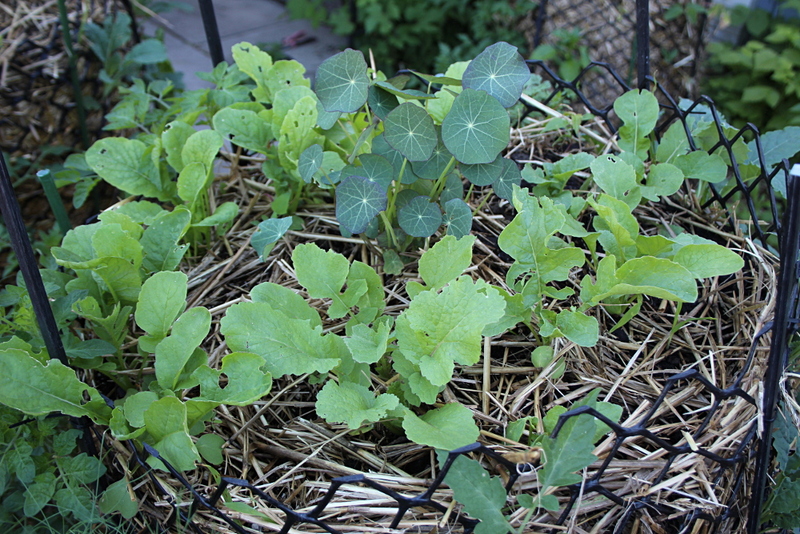 Nasturtium – Empress of India, surrounded by radish seeds. 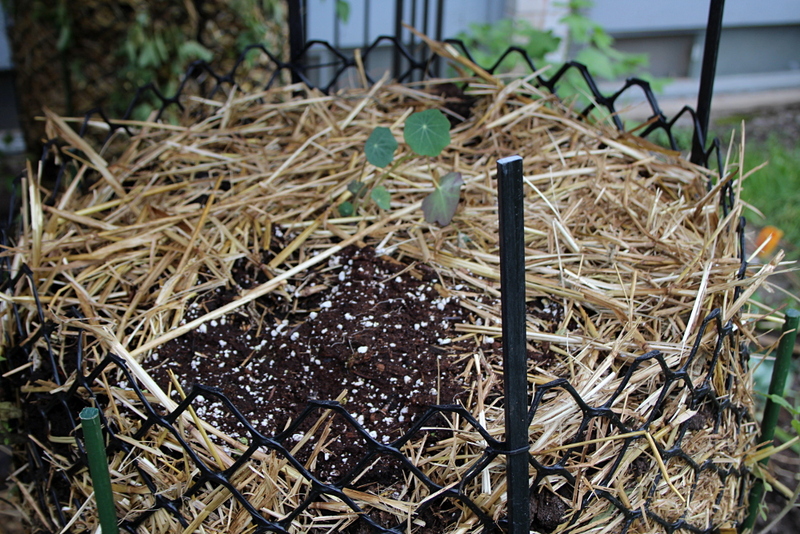 The radishes have sprouted and I had to thin them out, transplanting a few into the top of Tower 2. 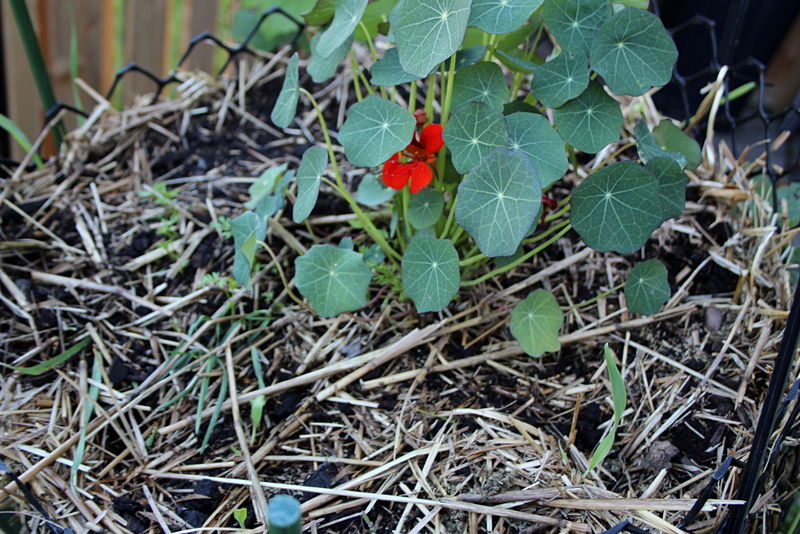 The nasturtium is growing slower than the one on Tower 3. 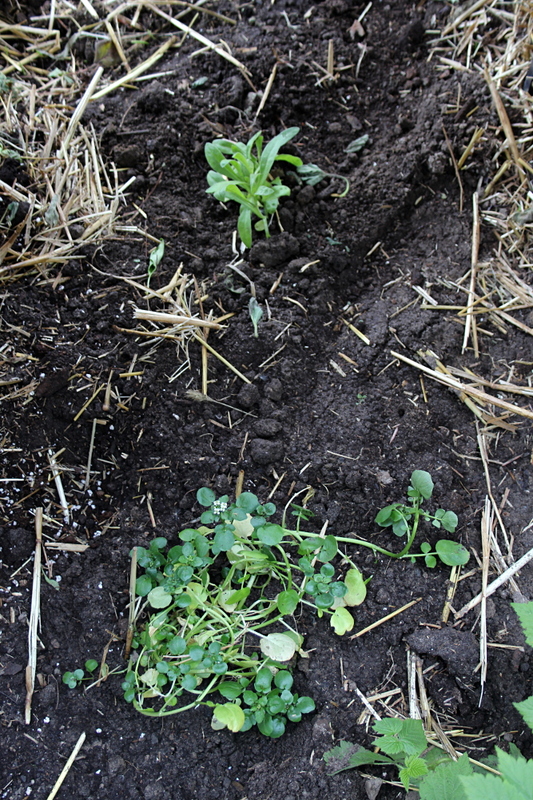 The radishes are quite happy. 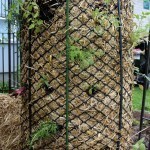 Red cherry tomato, Brandywine tomato, and rosemary below in one section, and in the next section – another red cherry tomato, followed by dill, a Brandywine tomato, and Lebanese cucumbers. 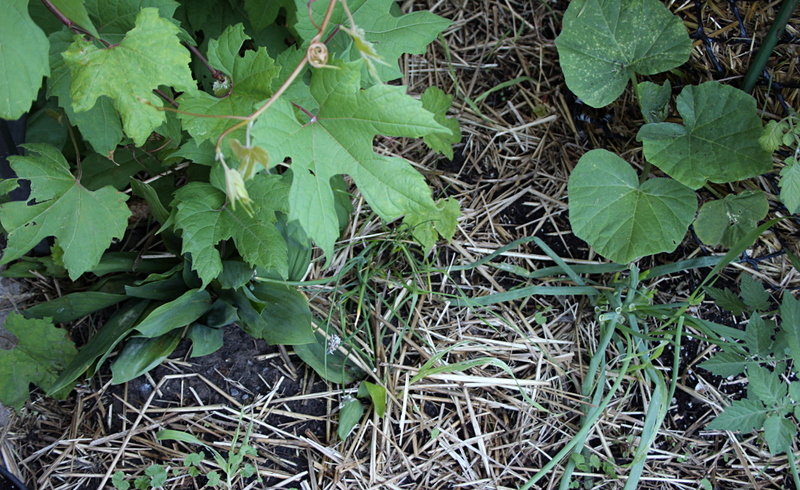 Lebanese cucumber leaves got eaten by someone, so the plant is not doing well. 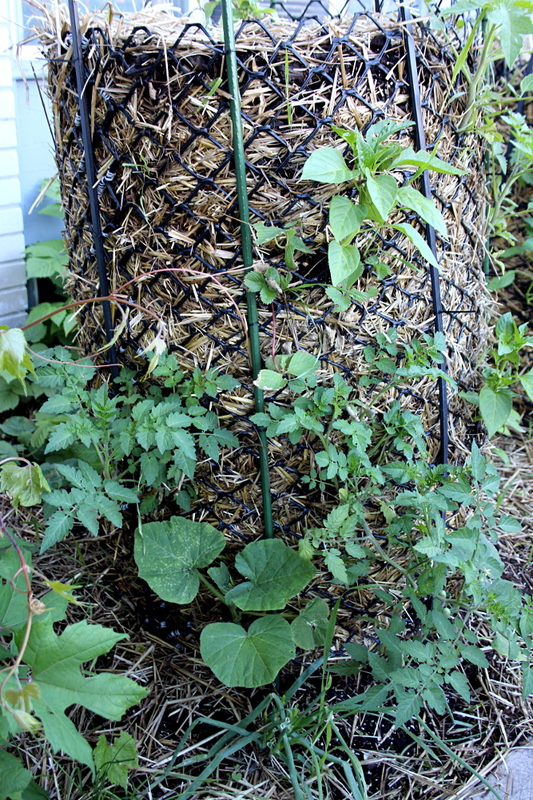 It is hard to capture the tower from the same angle, as the West fence is now in place, so I had to instead provide a side view in the last photo, capturing the first section with two tomatoes and rosemary. 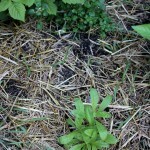 The next section is shown as part of the next series of photos. 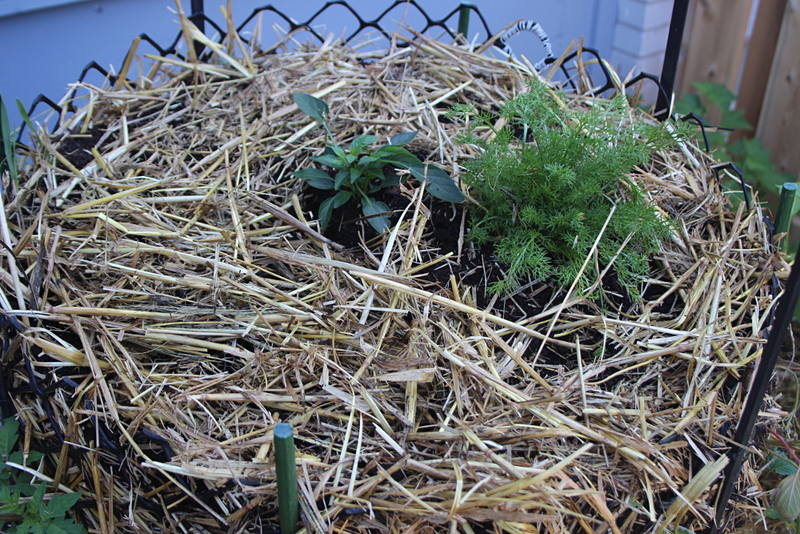 The tomatoes, the dill, and rosemary all seem to be doing well. 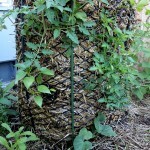 Red cherry tomato, followed by dill, a Brandywine tomato, and Lebanese cucumbers from the photo above, and in the next section – early Roma tomato, dill, Brandywine tomato, and eggplant at the bottom. 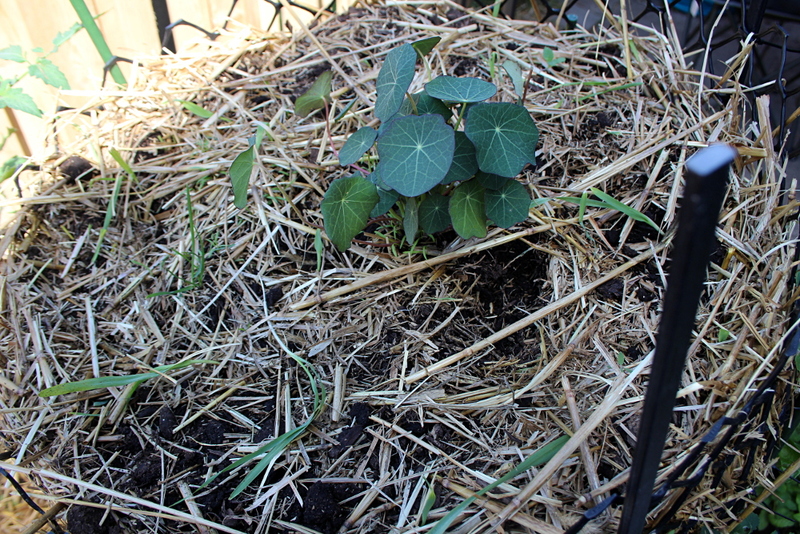 Aside from the sad fate of the Lebanese cucumbers described in the previous paragraph, the rest of the plants are doing well. 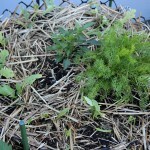 I have used the dill from both sections in salads a few times as well. 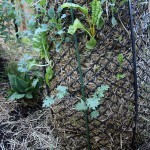 Three green kale and two oakleaf kale in one section, and in the next – three green kale and one oakleaf kale. 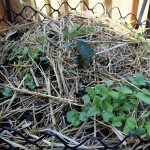 The kale plants are doing well. 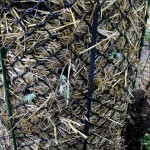 Along the bottom, between Tower 4 and the lemongrass, I have planted sweet peas, on June 1st. 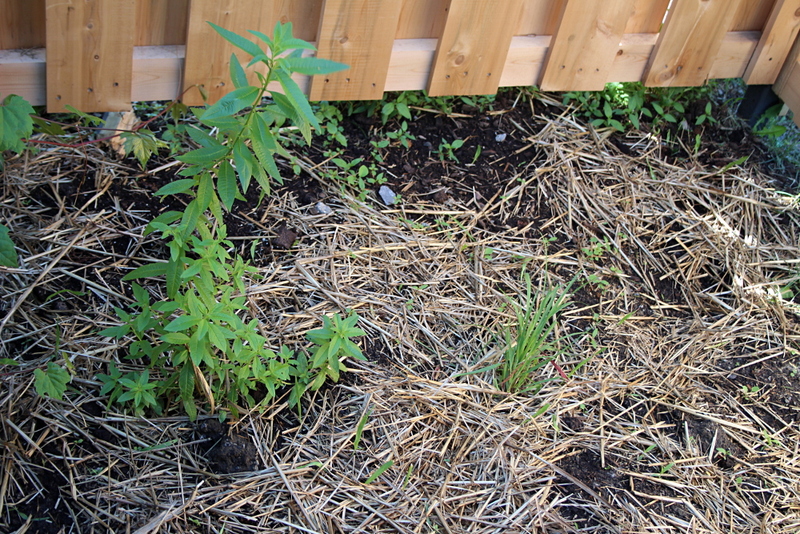 So far (day 20), a few of them have sprung up. 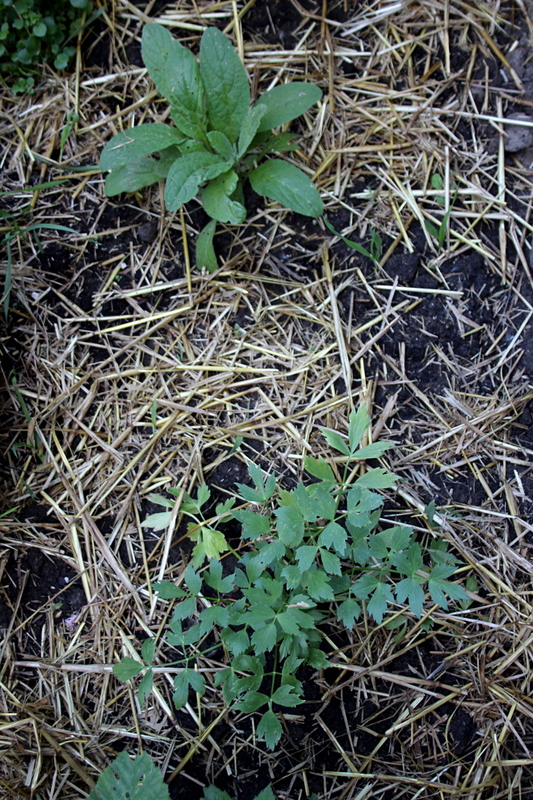 Cilantro between two green kale seedlings, and Swiss chard lower in one section, and in the next – tarragon, followed by two kale plants and a Swiss chard plant. 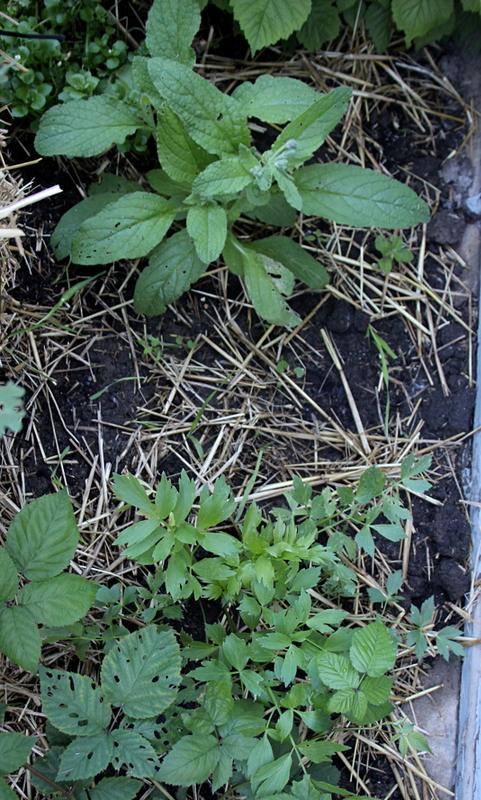 All of the greens are doing well, and I have already used cilantro in cooking. 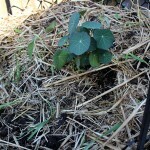 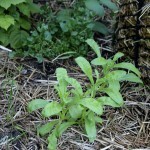 Along the bottom, next to winter savory, I have planted snow peas, on June 1st. 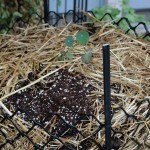 So far (day 20), a few of them have sprung up. 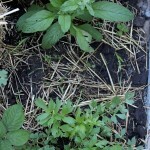 Borage at the top of photo, lovage lower, behind Towers 1 and 2. 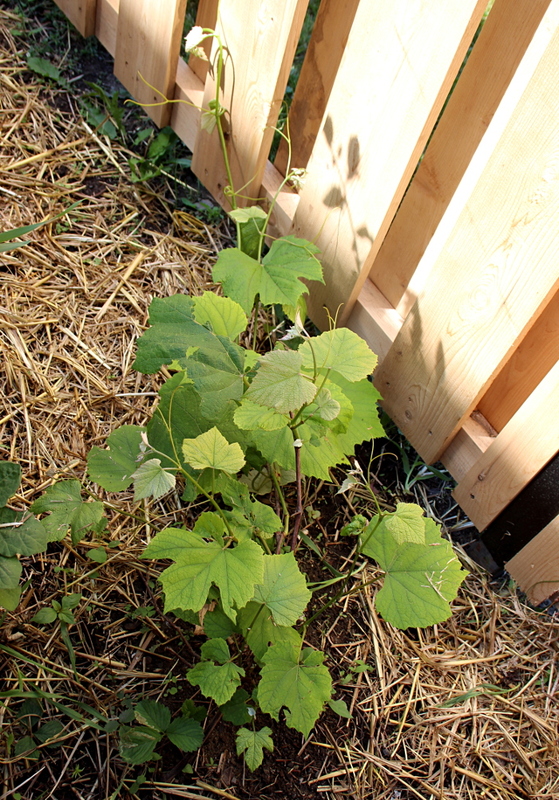 Both plants are happily growing, although borage is being overshadowed by the raspberry bush, while the blackberry bush is growing over the lovage. 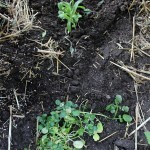 Calendula at the top of the first photo, watercress lower, last two photos – reversed: calendula being at the bottom, and watercress at the top. 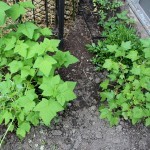 Both are growing well, and watercress is flowering. 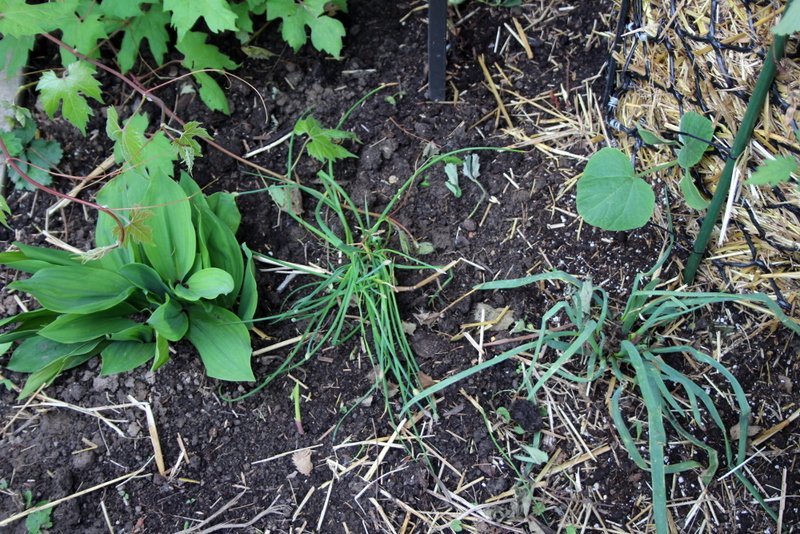 From left to right: grape vine 1, lily of the valley, chives, onions, Tower 1 butternut squash. 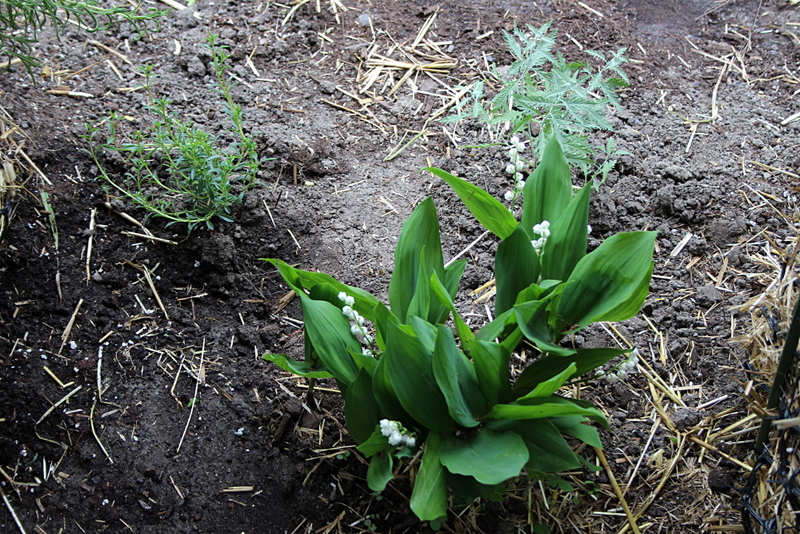 The lily of the valley and the chives are being mostly overshadowed by the grape vine, with the chives putting out flowers but not growing much. 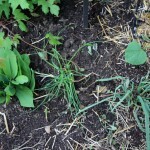 I have been harvesting the onions and some chives for salads. 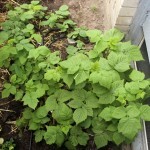 The squash is doing well. 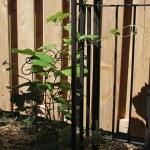 The grape vine is detailed in the next series of photos. 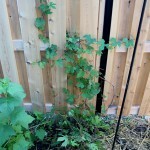 Grape vine 1, came with the property, does not give fruit. 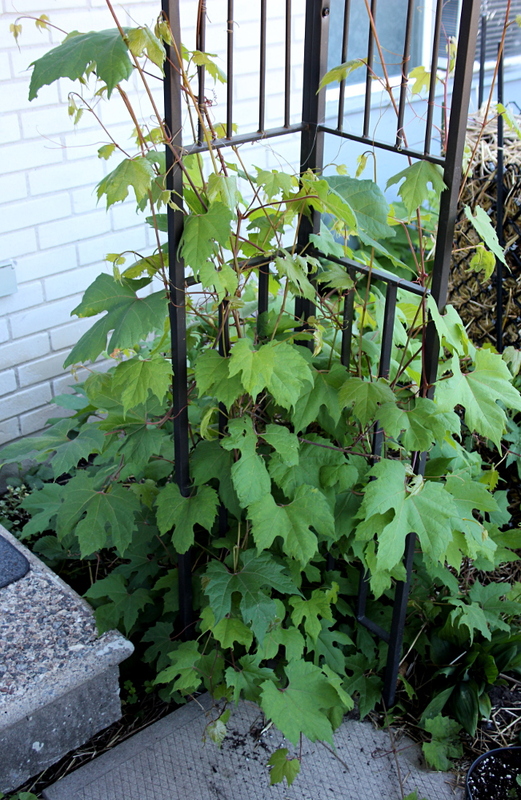 This grape vine has grown rapidly during the previous three summers, and despite a part of it being destroyed during construction last year, it’s coming back strong. 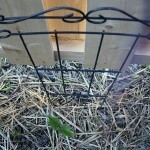 I have installed plant supports behind it to help guide it towards the gazebo and have started training it on one of the gazebo pillars. 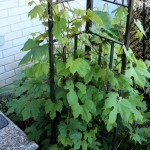 Grape vine 4, Concord Purple Grape, planted last year, next to Tower 3. 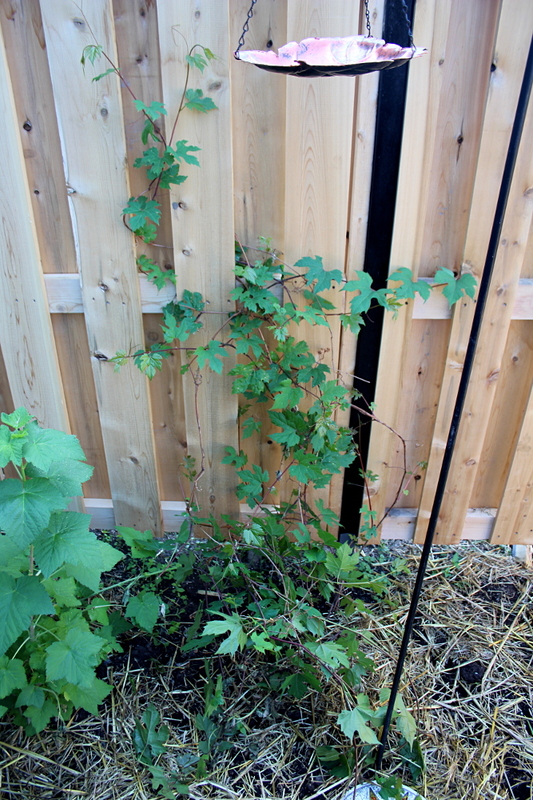 This vine did not give fruit last year and most of the leaves last summer have been destroyed by pests. 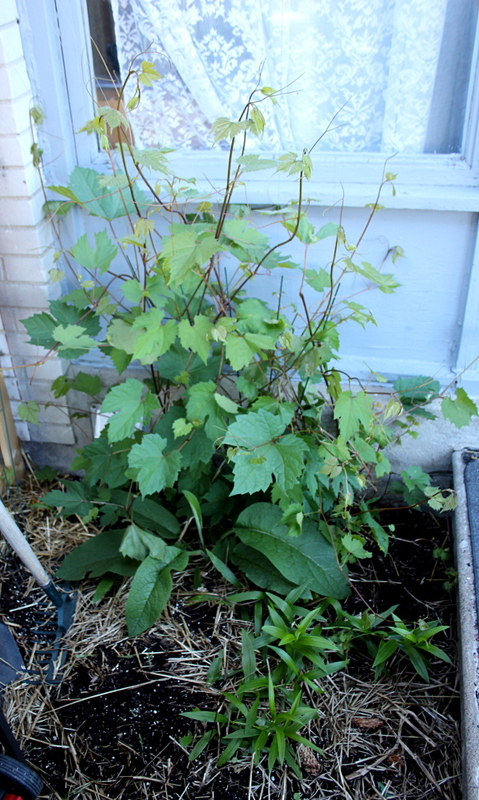 I have covered it for the winter (as I did with grape vine 1) and it seems to be coming back well this summer. 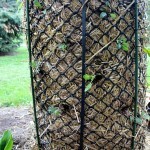 I will be looking into ways to control for pests without using harsh chemicals. 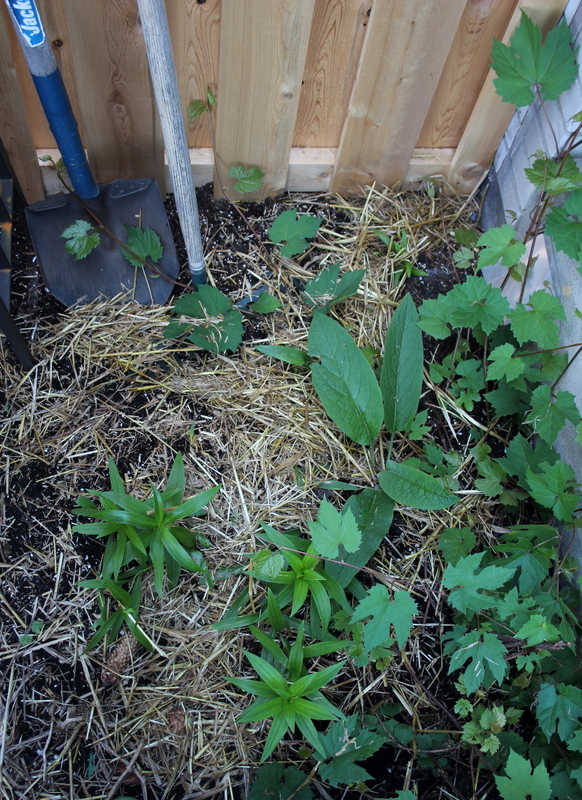 Day lilies, comfrey, and remains of grape vine 2, butchered during last year’s roof replacement. 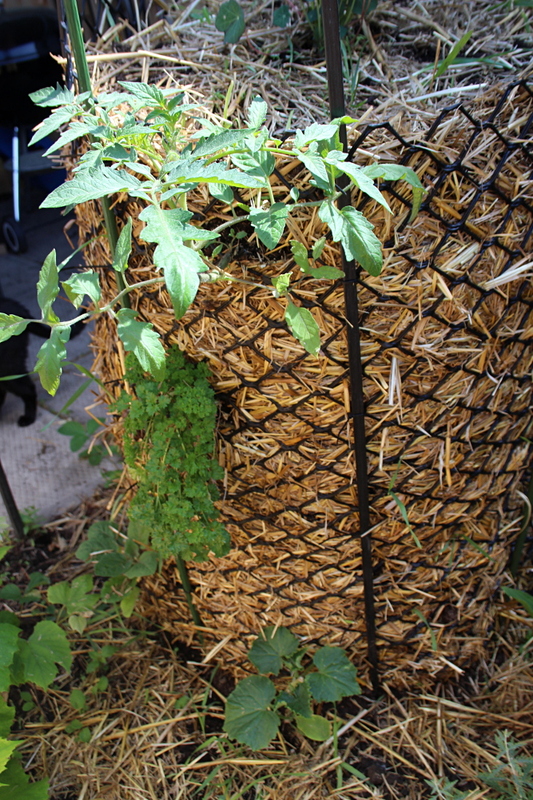 Comfrey is growing giant leaves, and is now largely in the shade of the rapidly growing Grape vine 2, which I have started to train along fishing line attached to the gazebo. 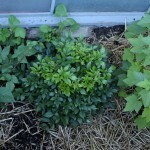 Otherwise it would overgrow the small piece of land by the porch and will not let anything else get any light. 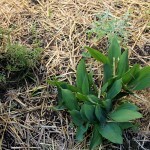 The lilies are growing as well. 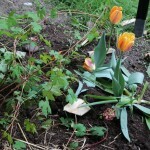 Grape vine 3, next to fence (to be reconstructed), with tulips and hyacinths. 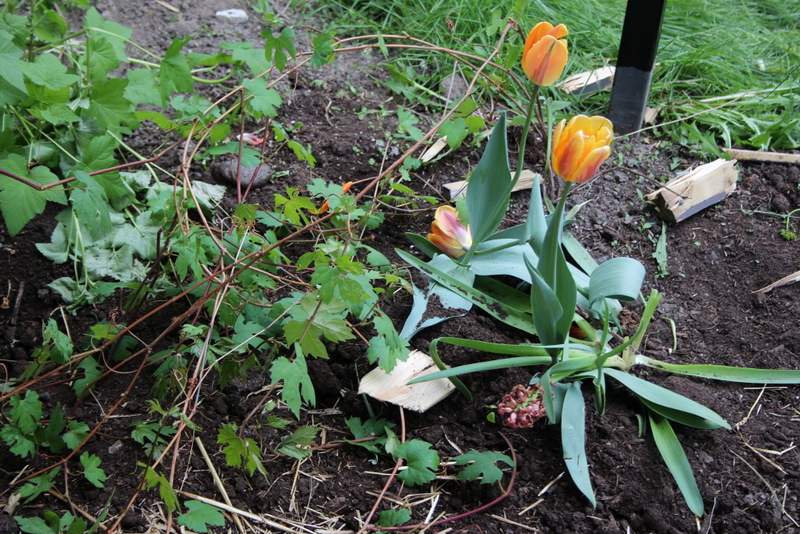 The tulips and hyacinths have bloomed and I have removed them to make space for the bird feeder. 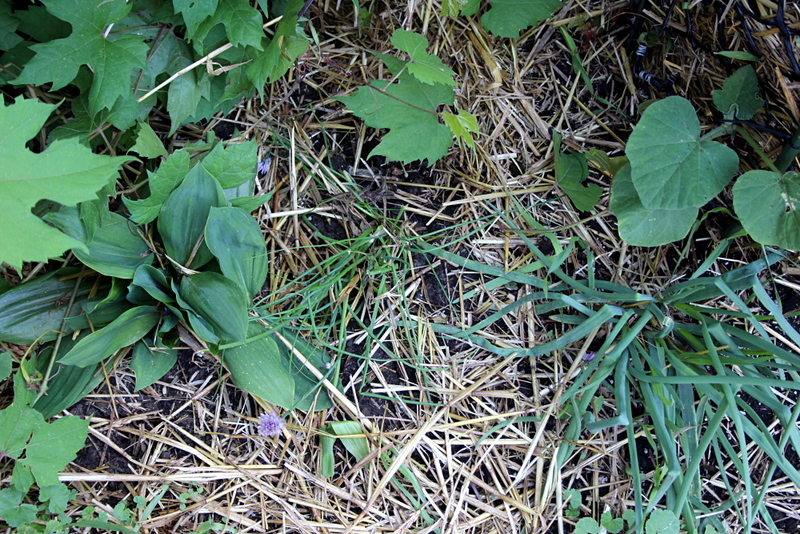 I have kept the bulbs to be planted in the fall once more. 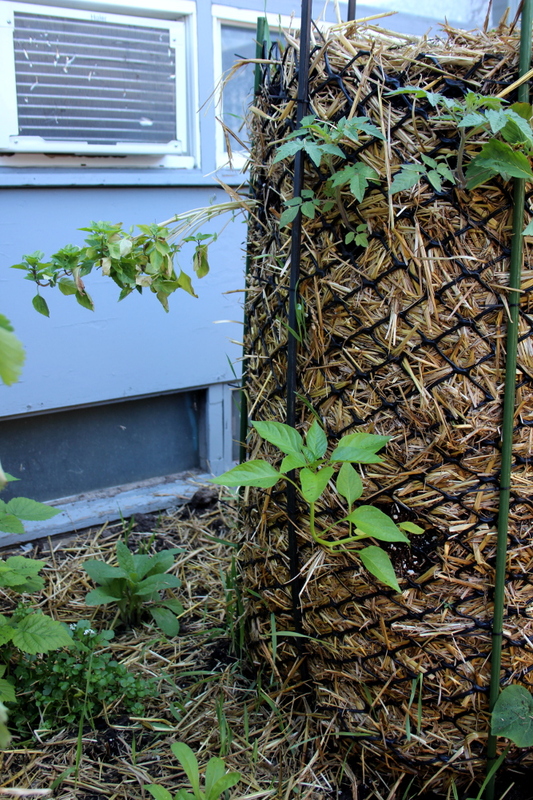 I have installed the shepherd’s hook with a bird feeder and a bird bath, and have started training the grape vine to go up the pole. 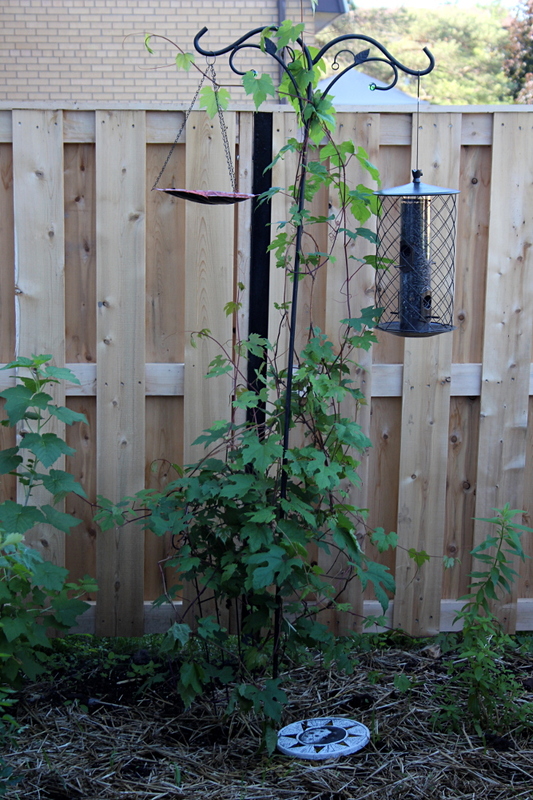 It has been hard to attract birds to the garden so far, since the feeder is too close to the building – yet we have little option regarding its position. 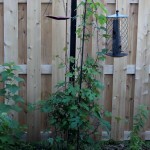 I have tried leaving a trail of seeds from the tree where birds chirp in the morning to the feeder, and someone has definitely eaten it, but since the seeds in the feeder are not diminishing, I’m assuming we have provided dinner to a larger bird or a squirrel, against which this feeder is protected. 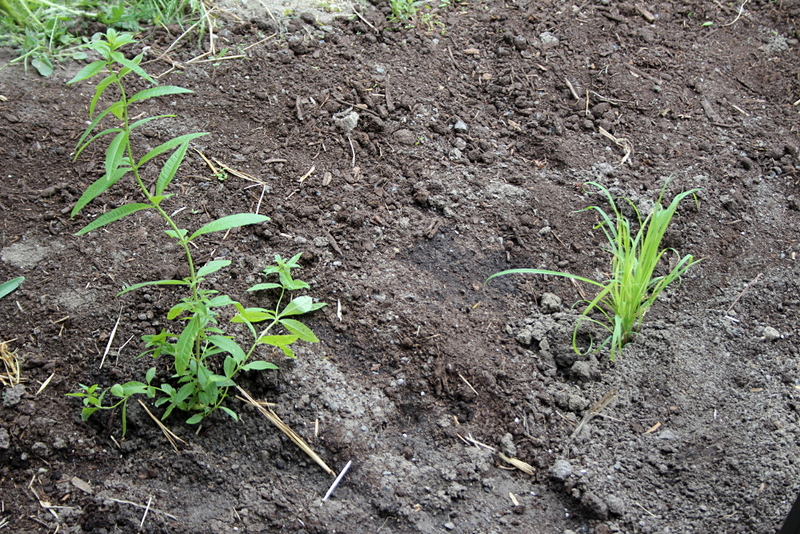 Lemon verbena on the left and lemongrass on the right. 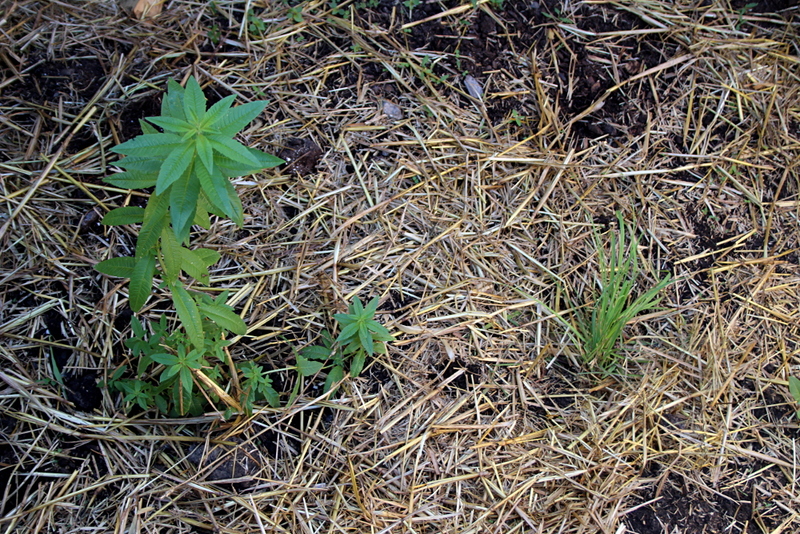 Lemongrass got a bit trampled during the installation of the South fence (I’m guessing the workers assumed it was a weed, or just plain didn’t look where they were stepping), but has survived. 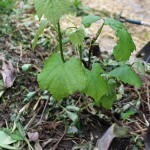 It has not grown much, however, and I’m not sure if our climate is favourable to its growth. 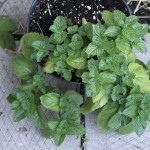 Grapefruit mint. 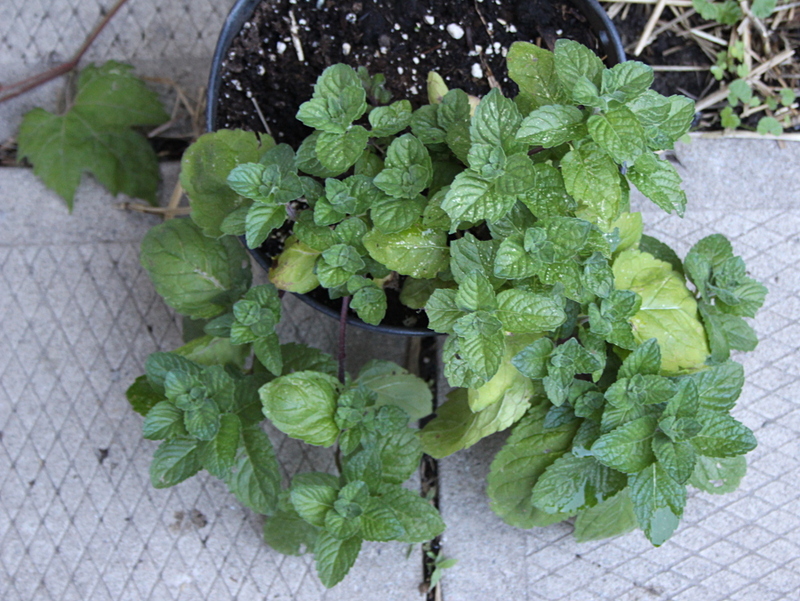 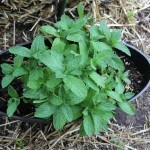 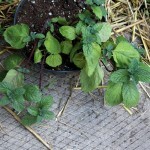 A little unhappy after replanting, the mint has come back in all of its might, and is now growing new leaves. 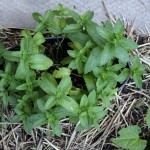 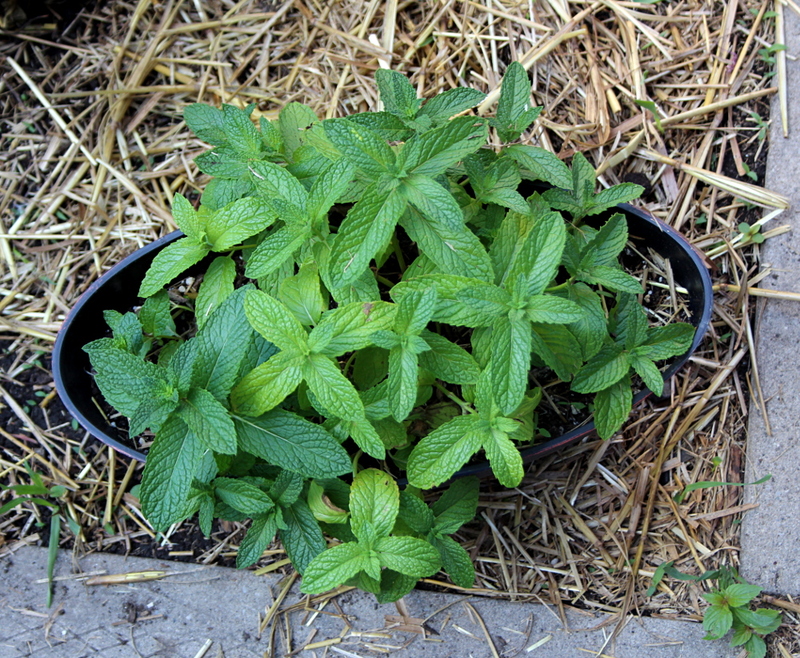 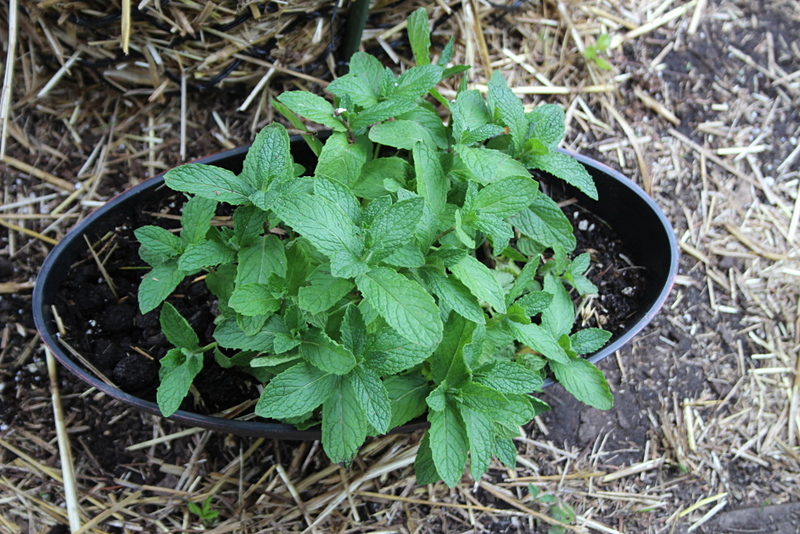 I’m keeping it in the pot, knowing how easily mint can take over the garden. 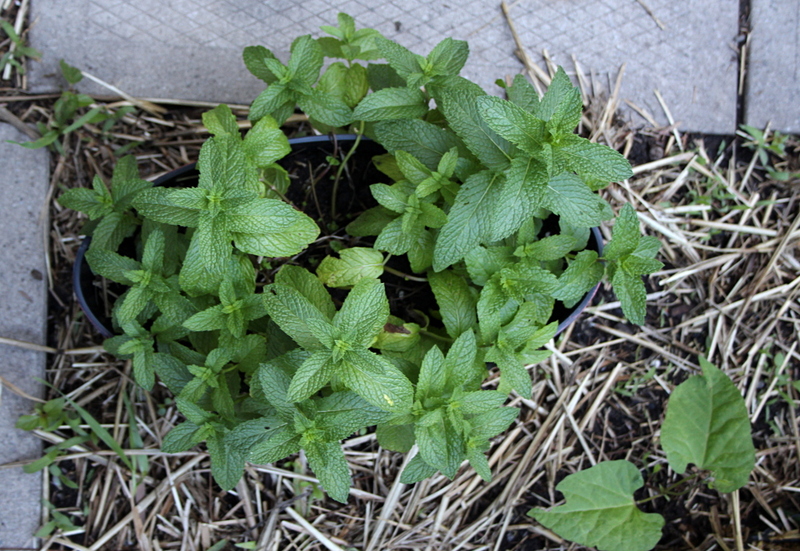 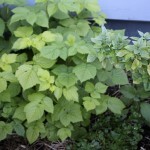 Garden mint. 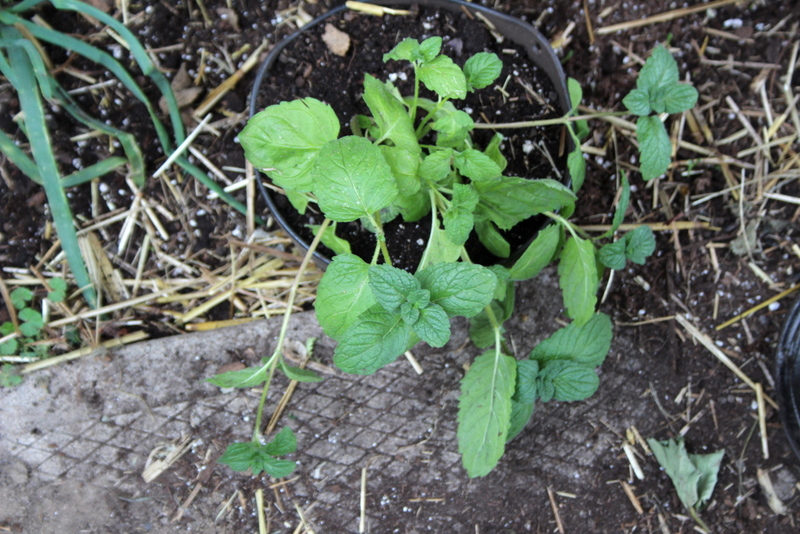 Kept in a pot for the same reason as the grapefruit variety, it has been quite happy once the roots took. 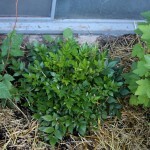 On the first two photos: left – winter savory, top right – Russian sage, bottom – lily of the valley. 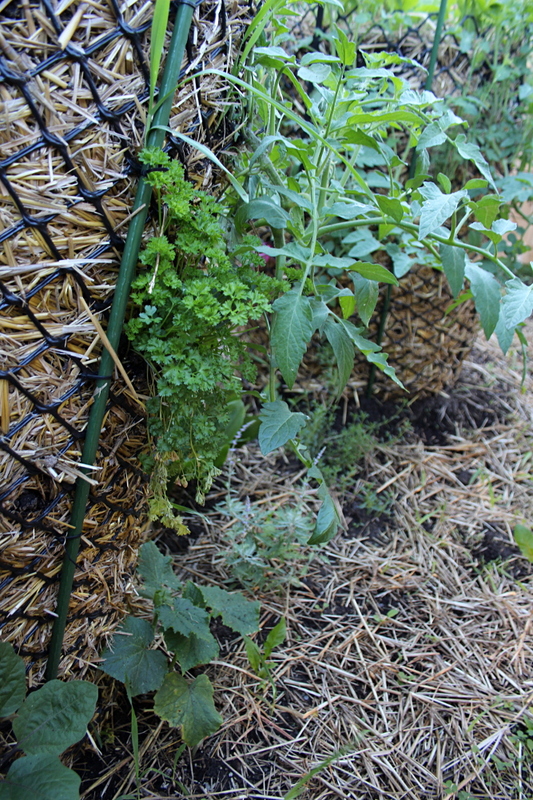 Because of the sun, the recently-installed West fence, and the tomato overshadowing the savory, I have taken the last photo from the other side, with lily of the valley being at the top, the winter savory on the right, covered by a tomato branch, and the Russian sage on the bottom left. 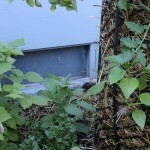 It is hard to tell from the photo, but the sage has put out purple flowers. 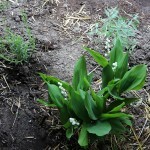 The lily of the valley has flowered already, and all of the plants seem happy. 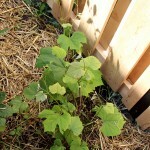 Two currant bushes between Tower 2 and the South fence. 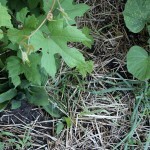 I know that one of the bushes is black currant, yet unsure whether the other one is black or red. 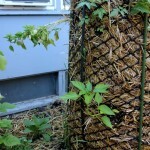 So far neither has gone past the green berry stage, so perhaps we shall discover their nature this year. The first photo has been taken from the spot where the South fence now resides, and so the last two photos are taken from the opposite side, with the larger bush being on the right. 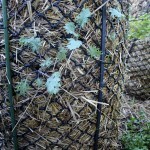 The smaller bush is depicted in the photo series below as well. 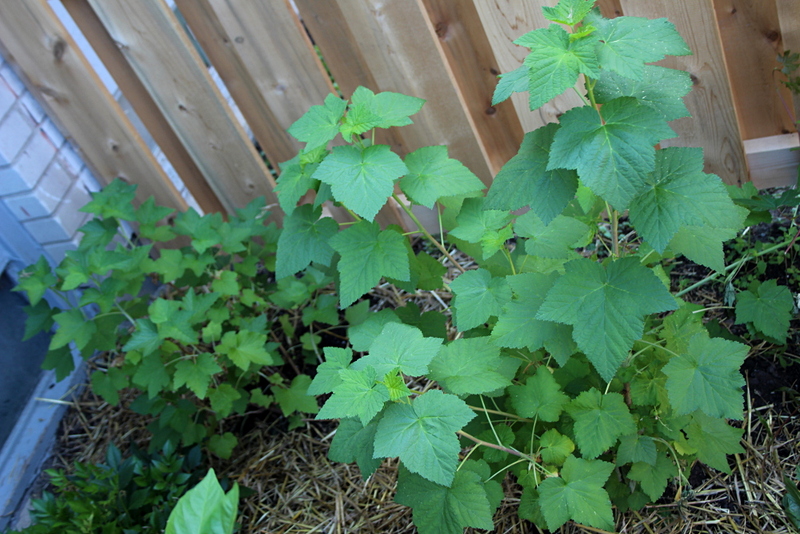 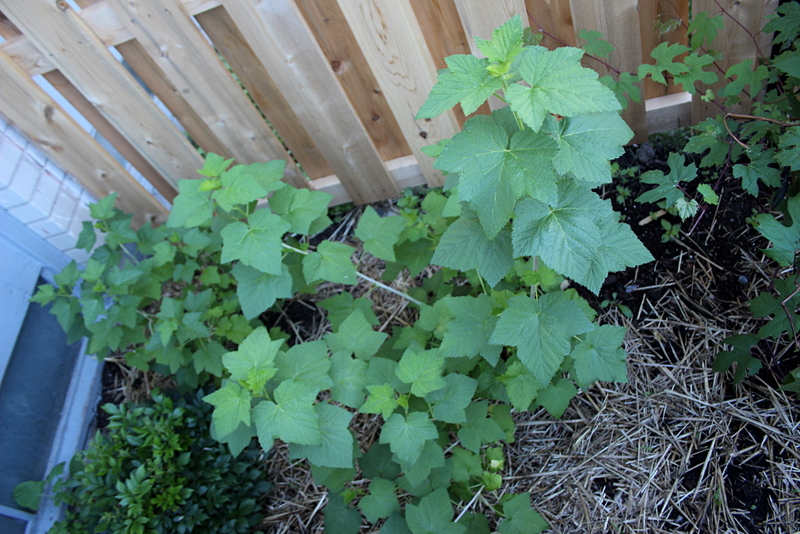 Two currant bushes between Tower 2 and the South fence, unknown perennial plant along the window, and what I suspect is our blackberry bush planted last year – Black Satin Blackberry. 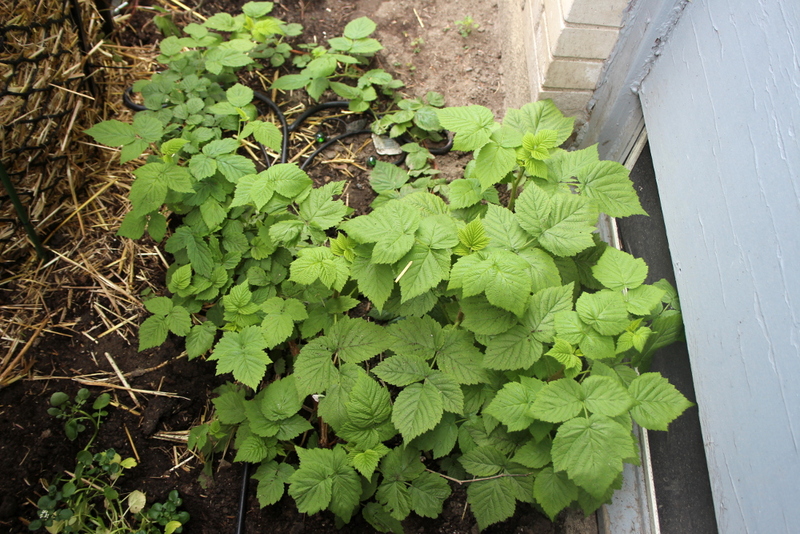 The blackberry was hardly flourishing last year, and so I assumed it would not have survive the winter. 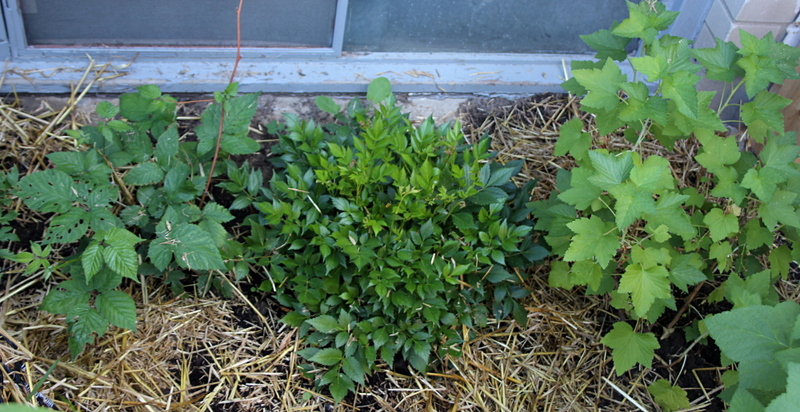 However, once the garden was cleared of weeds in the spring and the towers installed, the bush started growing. 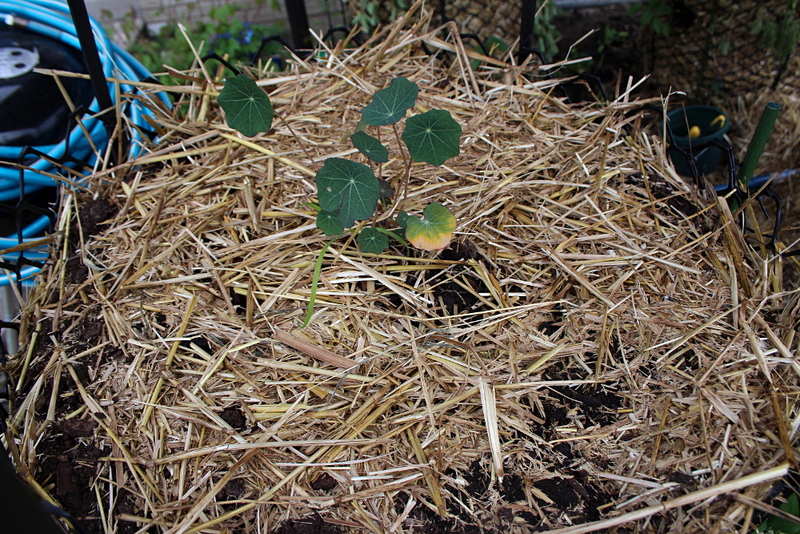 We shall see how it progresses. 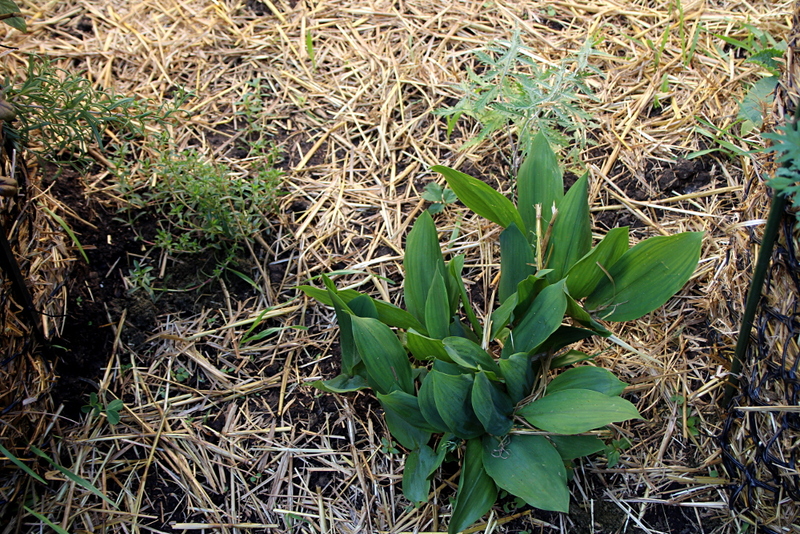 The mystery perennial plant has been replanted from the South-West corner of the garden where it has bloomed next to the rose for two summers. 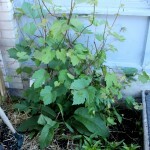 It has happily taken to its new place and has put out new leaves. 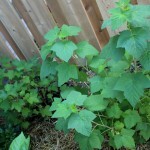 Raspberry bush along the building. 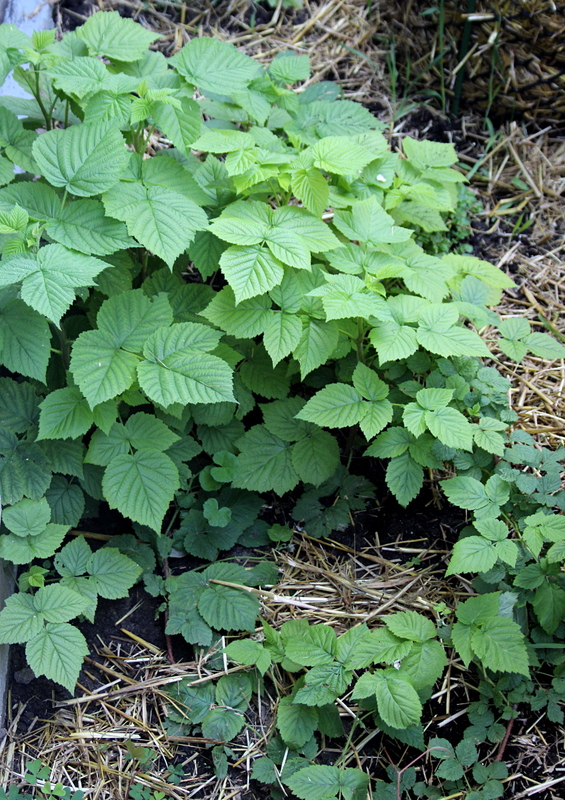 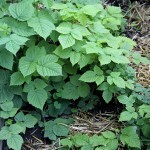 I have removed a large number of smaller raspberry plants that have sprung up around the garden, but have left the “mother bush” alone. 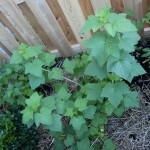 It seems to be growing well, overshadowing the borage plant. 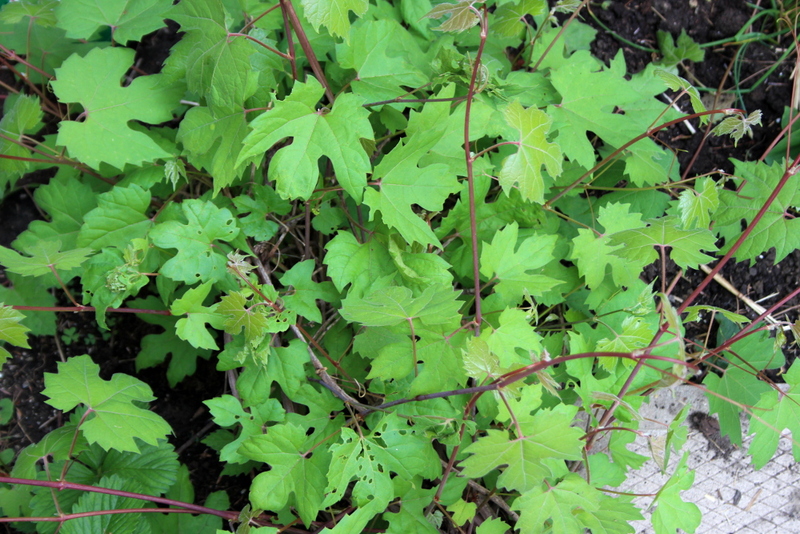 Hopefully we get some berries this year – it only gave us a handful last summer. 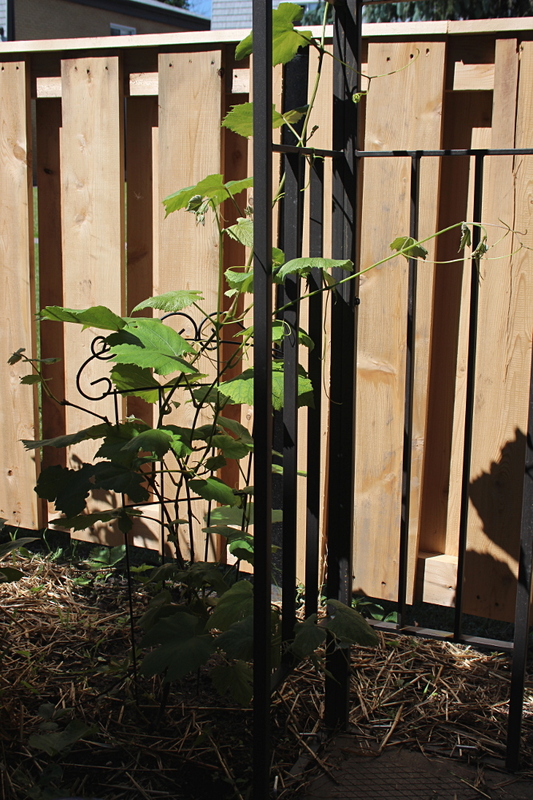 Scarlet runner beans along the West fence. 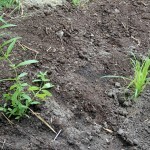 I have planted these on June 11, and so far (by day 10) one has sprouted. 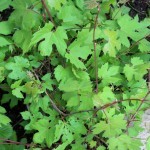 Puzzle: Grand Canyon, Arizona, U.S.A.